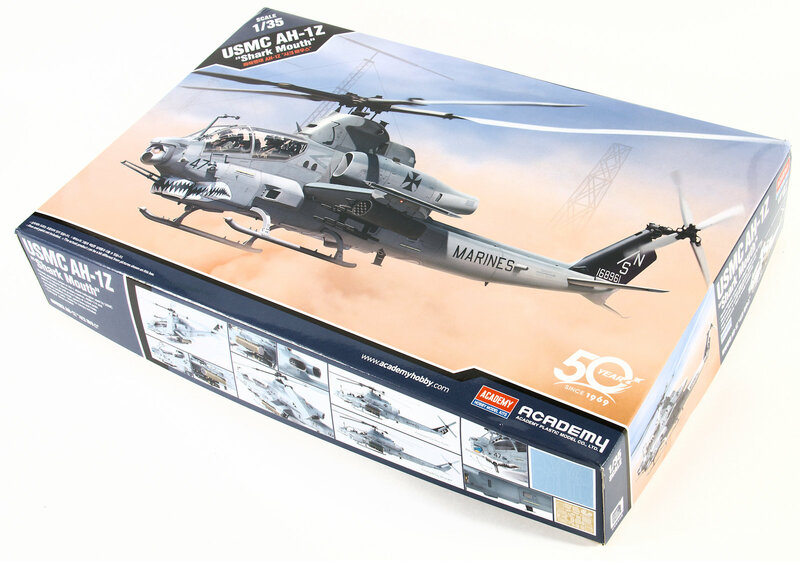 In-Boxed: USMC AH-1Z "Shark Mouth"
-The USMC's newest upgraded variant of the AH-1 attack helicopter used by the USMC. 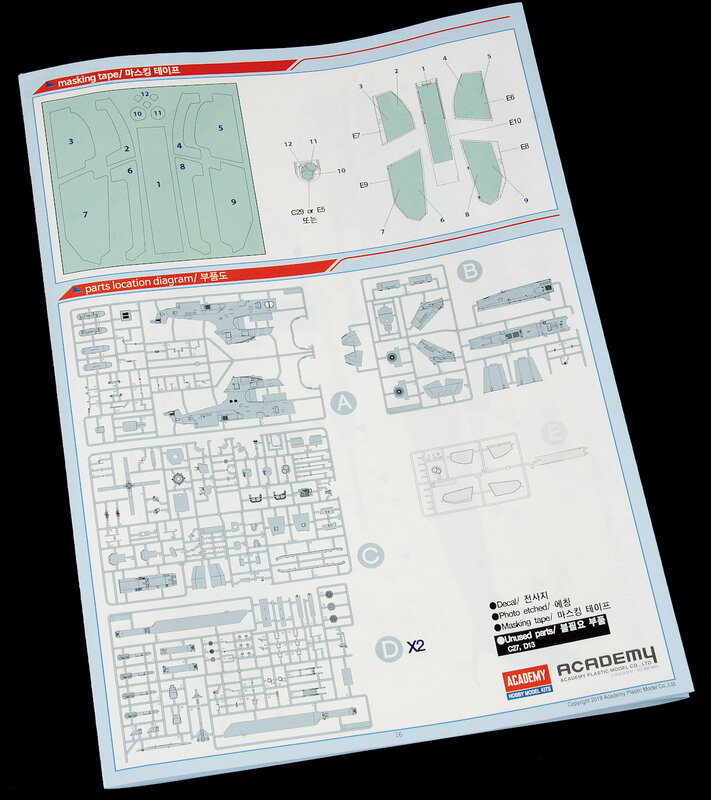 -Accurately detailed cockpit, panel lines and rivets. The product sheet looked good - but what about the real thing that we are looking at? 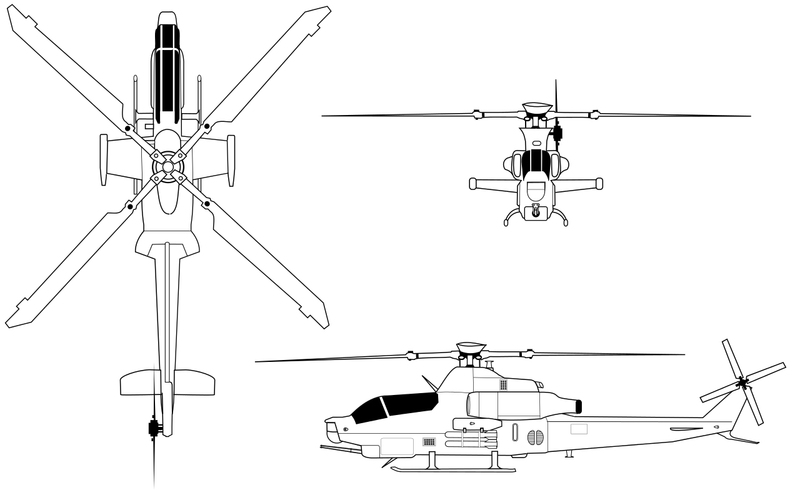 The AH-1T that was modified to the AH-1T+ demonstrator and then the AH-1W prototype was later fitted with an advanced composite four-bladed rotor system that provided better performance, less noise, and greater resistance to battle damage. 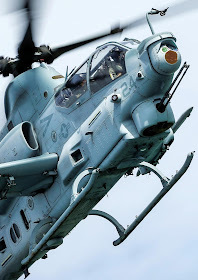 This "Four Bladed Whiskey (4BW)" Cobra didn't lead immediately to a production contract and the rotorcraft was returned to Marine service in a normal AH-1W configuration, but Bell continued work on the concept. 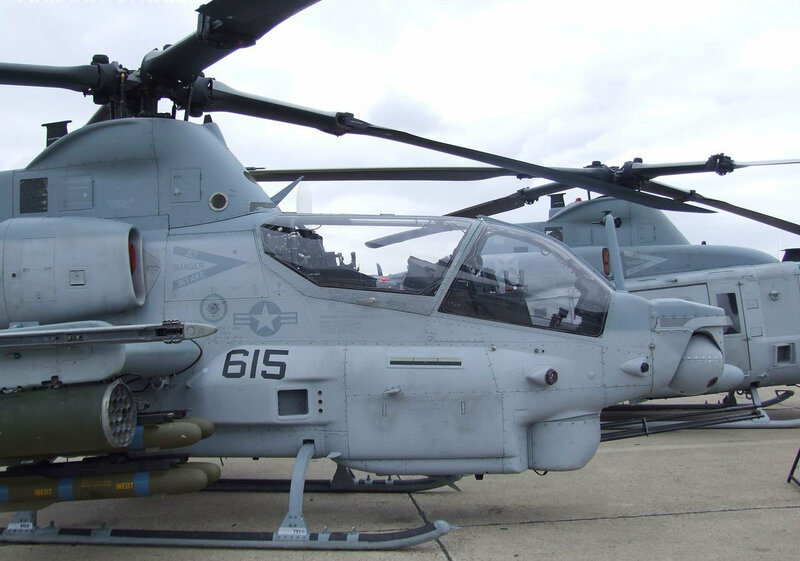 The US Marines signed a contract with Bell in 1996 to upgrade 180 AH-1W SuperCobras to the "AH-1Z" standard for service in the 21st century. 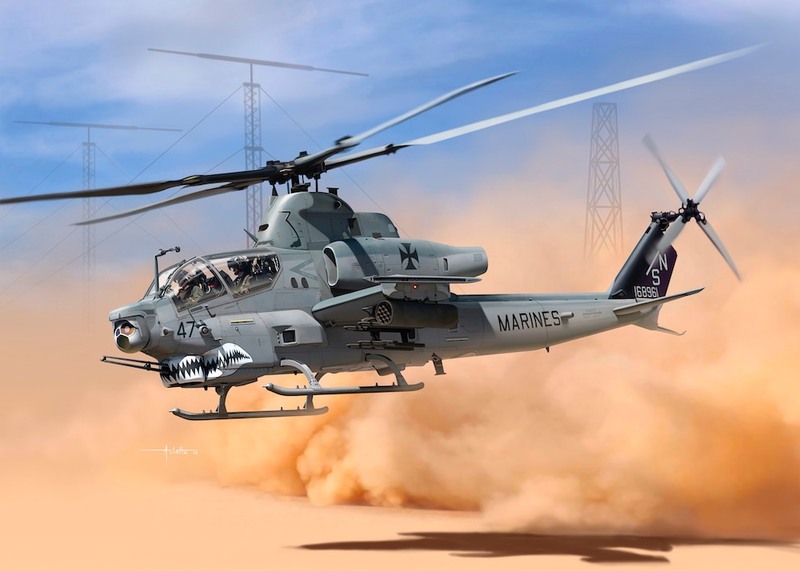 The "Zulu Cobra" AKA "Viper" features a new, quieter four-blade composite rotor with an automatic folding mechanism to make the helicopter easy to store on a ship, a 10,000-hour lifetime, and the ability to survive hits by 23- millimetre projectiles. 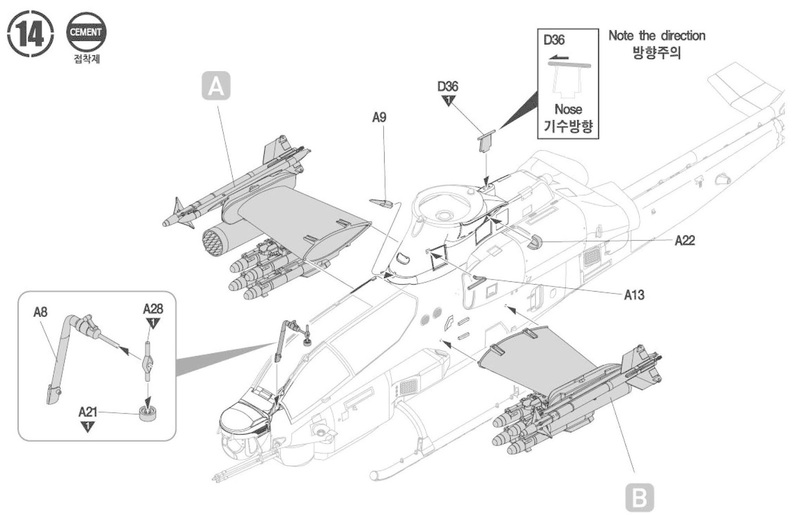 A four-blade tail rotor is also fitted. 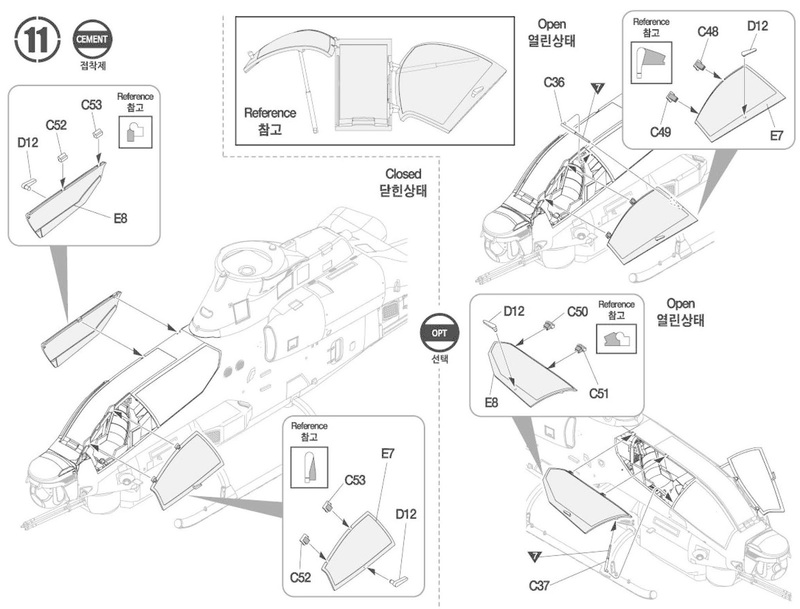 The T700-GE-410 Twin Pac used on the Whiskey Cobra is retained, but the Zulu Cobra features an uprated gearbox and transmission, fitted in a reprofiled fairing. 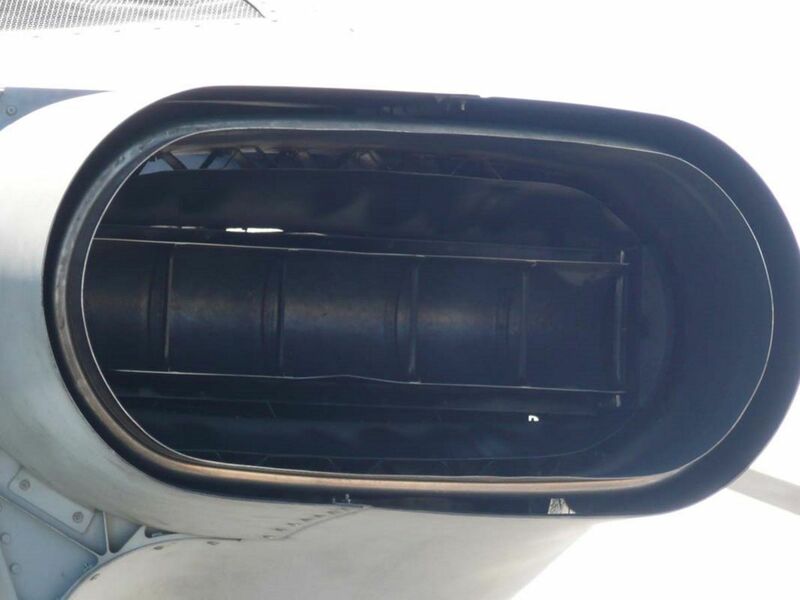 Fuel capacity is increased by 758 litres (200 US gallons), partly by using a "wet" wing with fuel storage, and the fuel tanks are filled with inert gas to reduce fire hazard. The AH-1Z upgrade also increases stores capability to six wing stations, including two wingtip stations for missiles like the Sidewinder, and four for unguided rocket packs, or TOW / Hellfire quad missile launchers. Cockpit and avionics are upgraded as well. 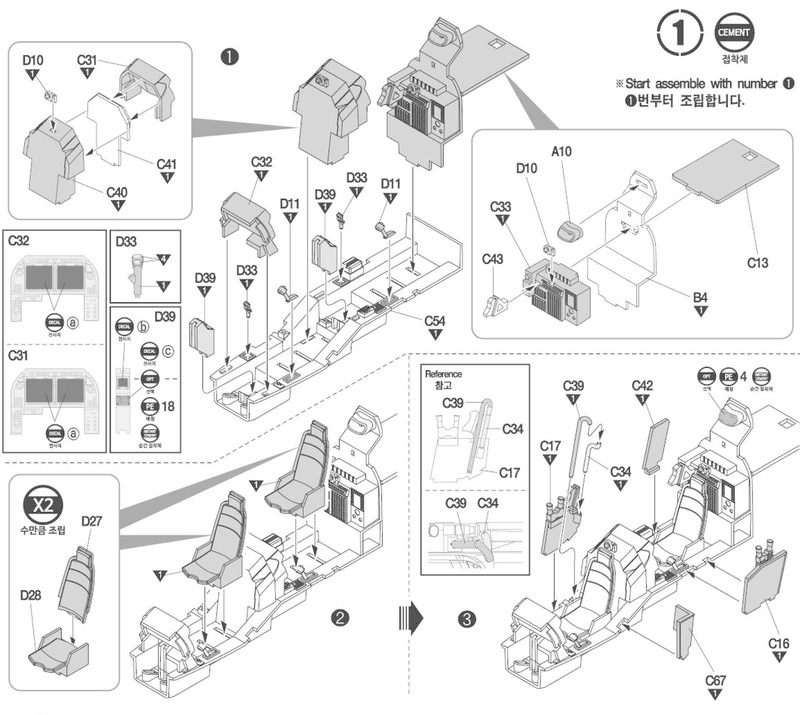 The new cockpit is completely redesigned, with switches conveniently arranged and "hands-on collective and stick (HOCAS)" flight controls. 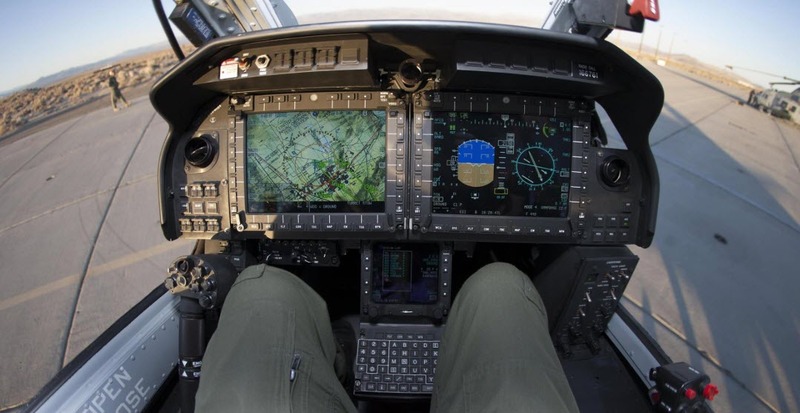 Other features include two multi-function 15 by 20 centimetre (6 by 8 inch) flat-panel displays for each crewman, with digital map display capability; secure radio communications; a tactical digital data system; and an inertial-navigation system incorporating a GPS receiver. 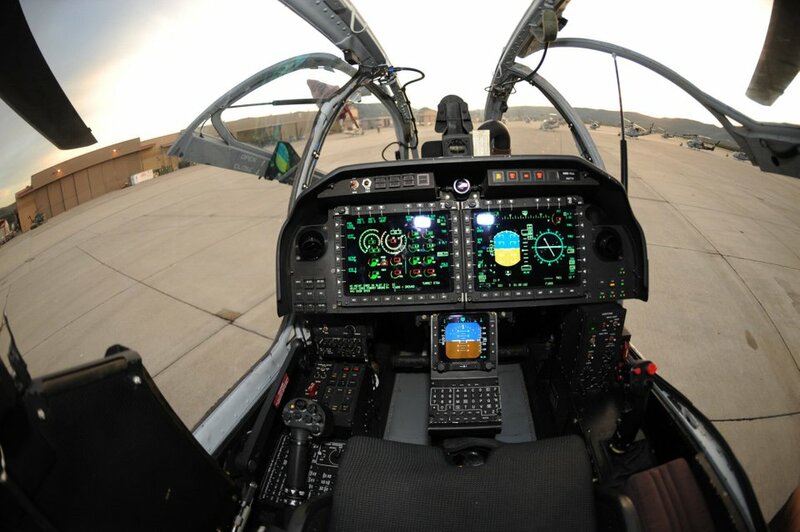 Both sets of cockpit controls are largely identical, allowing either crew person to fly the helicopter or fire its weapons. 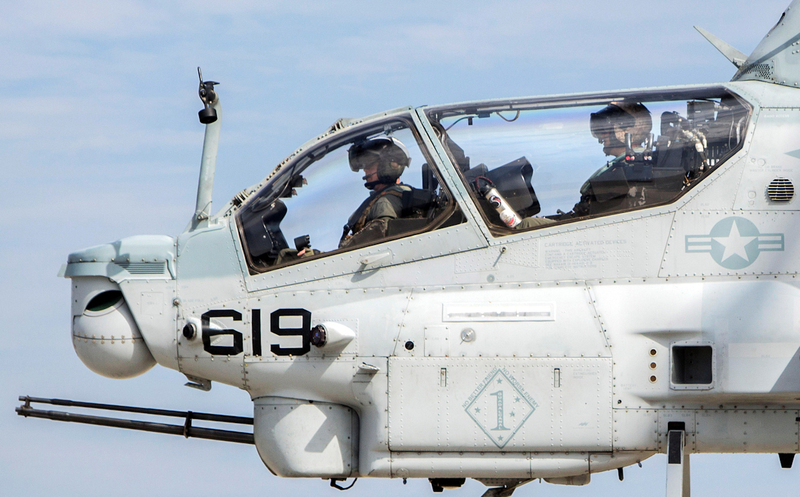 The AH-1Z is fitted with a nose-mounted AN/AAQ-30 "Hawkeye" Target Sighting System (TSS), featuring a FLIR imager, low-level-light colour zoom TV, a laser rangefinder, and an "eye-safe" laser target designator. The third-generation FLIR used in the TSS has large-aperture optics and an extremely effective stabilization system, allowing target identification from beyond the range of even the Hellfire missile. 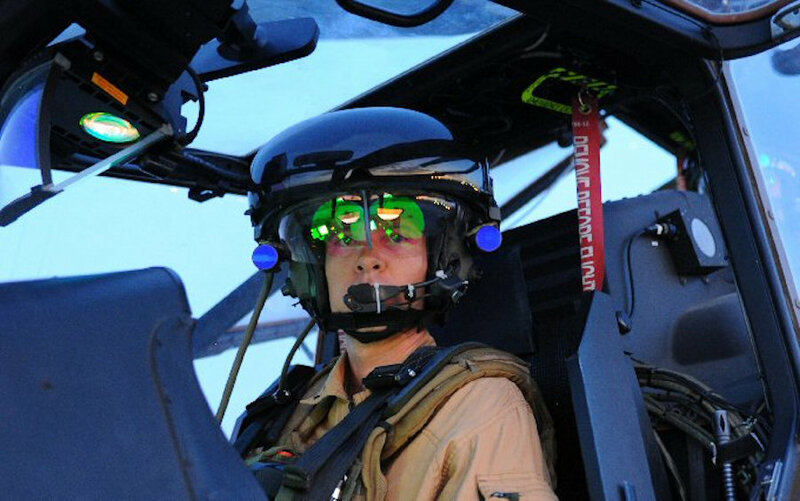 Zulu Cobra flight crews wear advanced "TopOwl" flight helmets developed by Thales of France featuring a high-resolution projection TV system that can display flight or targeting data and imagery on the visor in a "see-through" fashion, and also can be fitted with snap-in cameras to provide a highly integrated night-vision capability. The self-defence suite includes four AN/ALE-47 chaff-flare dispensers that can be set to manual, semiautomatic, or fully automatic modes. 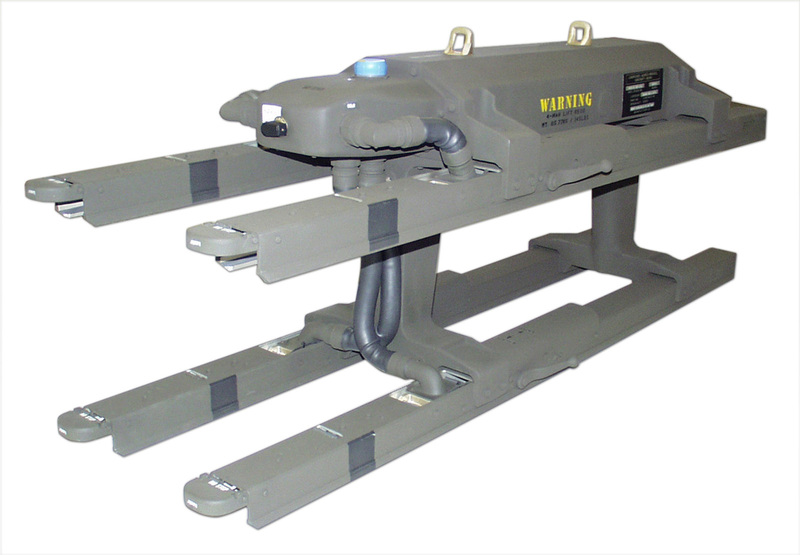 An improved AN/APR-39B(V)2 radar warning receiver is fitted, as well as an updated AN/AAR-47(V)2 missile warning unit while the Zulu's exhaust system also has a very low infrared signature. 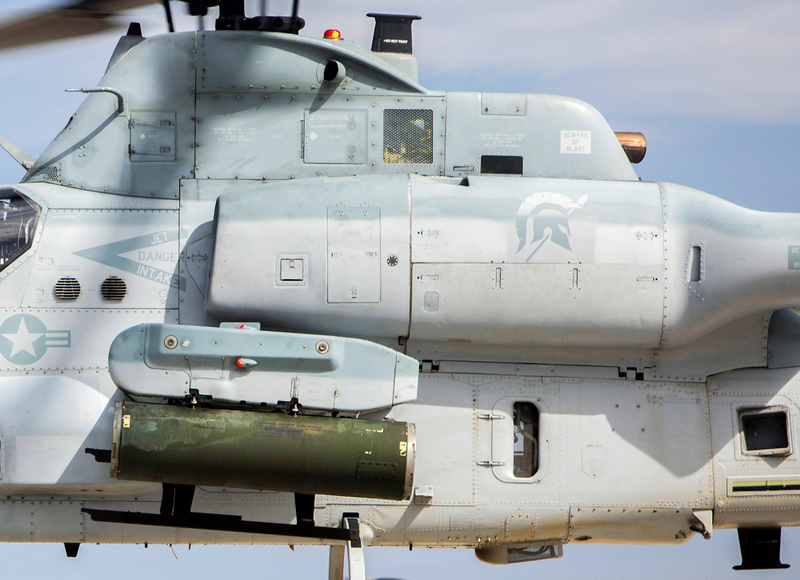 The AH-1Z is stretched to accommodate the new hardware and preserve its centre of balance. 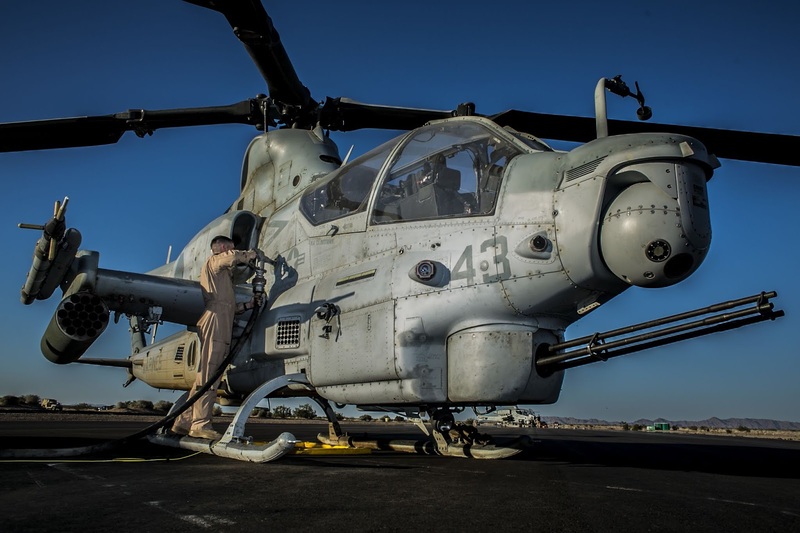 The upgraded AH-1W airframe is "zero-lifed" to ensure reliability. 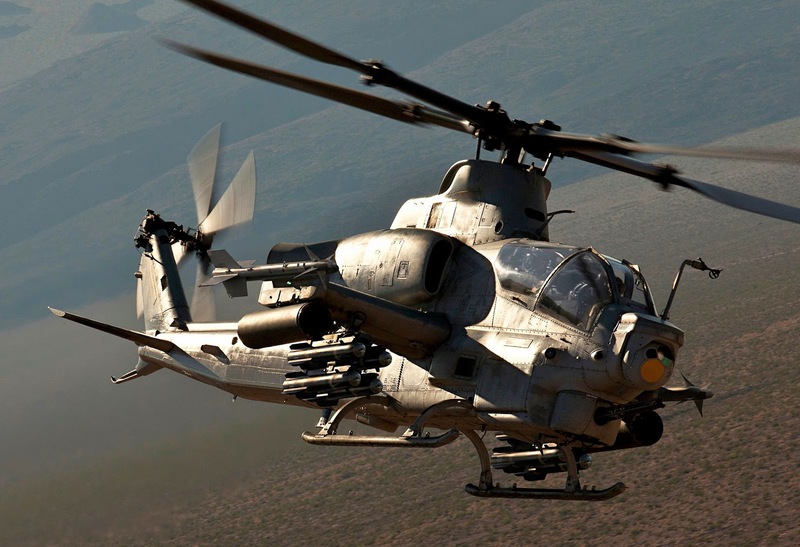 The Zulu Cobra carries 450 kilograms (1,000 pounds) more payload than the AH-1W, and cruises at 290 KPH (180 MPH), 40 KPH faster than the AH-1W. 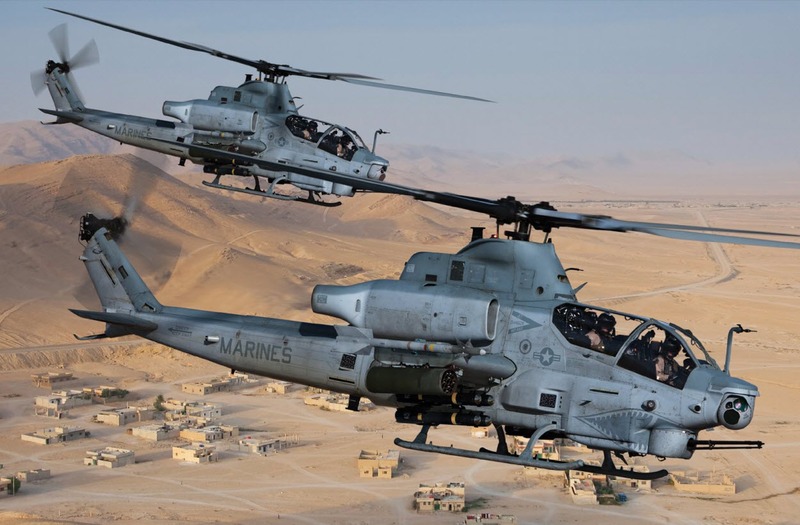 Combat radius for the AH-1Z is 200 kilometres (125 miles), while the combat radius of the AH-1W is only 70 kilometres (44 miles). 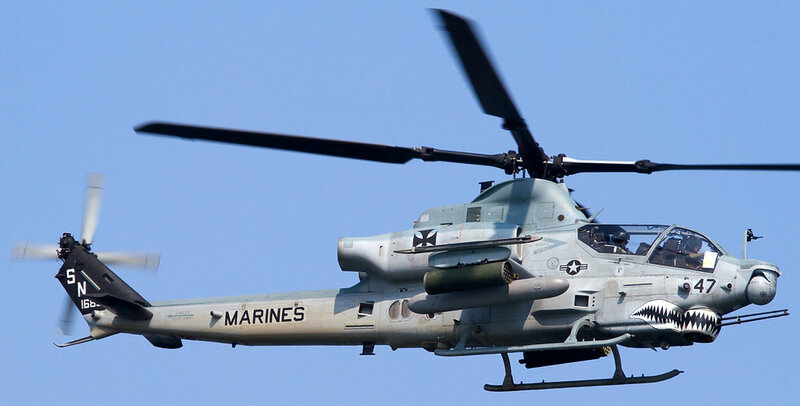 The AH-1Z has a maximum takeoff weight of 8,390 kilograms (18,500 pounds), compared to 6,690 kilograms (14,750 pounds) for the AH-1W. 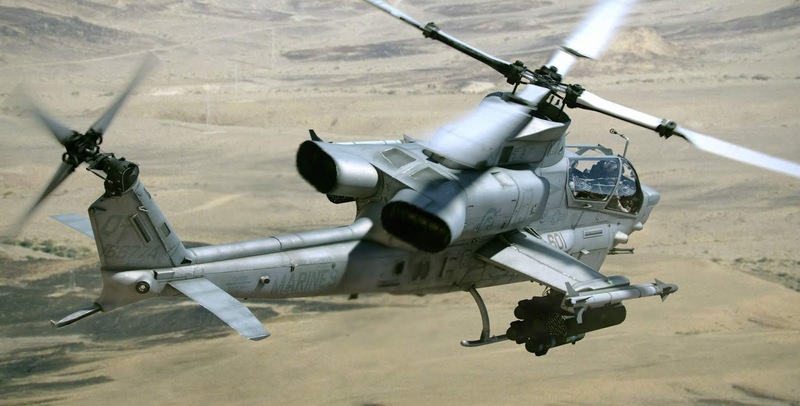 First flight of a prototype AH-1Z was in December 2000, with initial remanufacture of operational aircraft beginning in October 2003 and deliveries ongoing. Cost of each upgrade is $11.5 million USD, and each upgrade takes 13 months. 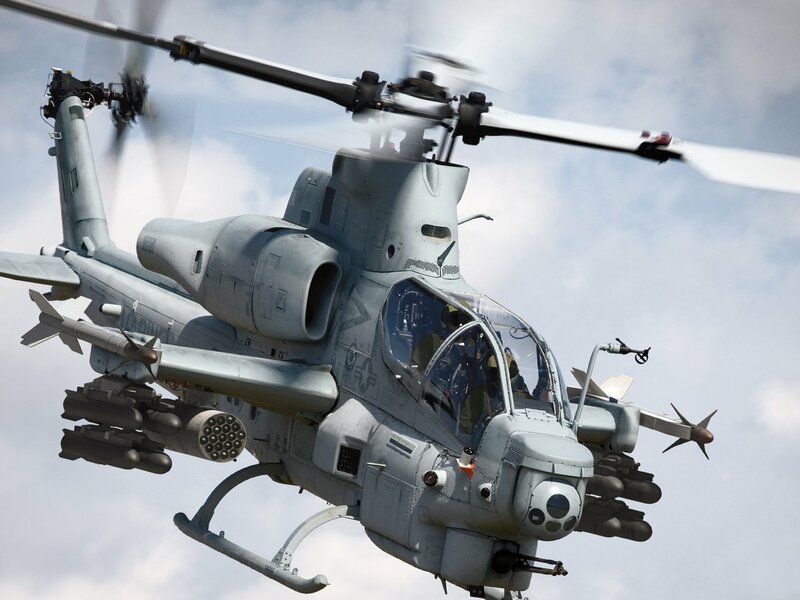 That's not much less than the cost of a new-build machine, and so the production contract was amended to include new-build AH-1Zs. Current plans envision total deliveries of 189 Zulu Cobras, including 58 new-build machines, the last to be delivered in 2019. 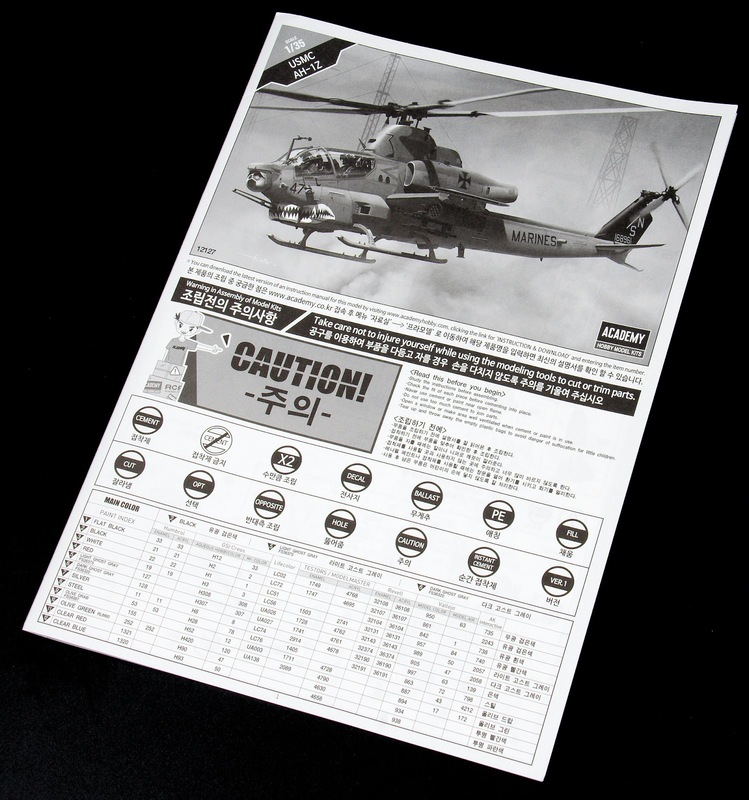 Inside the box, we have some coloured warning paper signs, a black and white fold-out instruction manual, a colour fold-out markings and colours guide for painting, a small vinyl masking sheet and photo-etch fret. 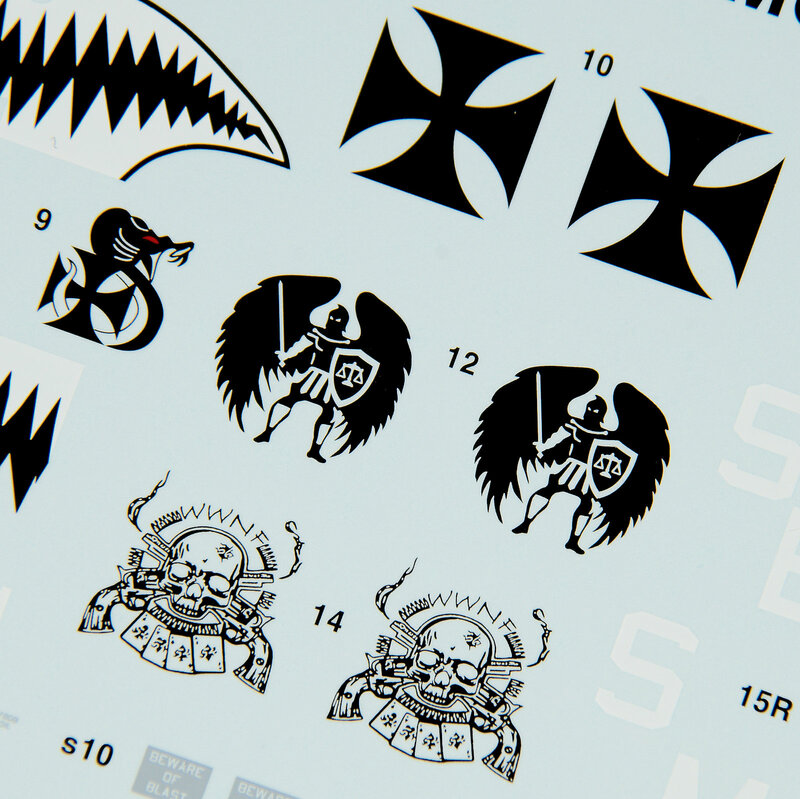 One decal sheet and lastly five duck-egg light blue sprues and one clear sprue for transparencies. 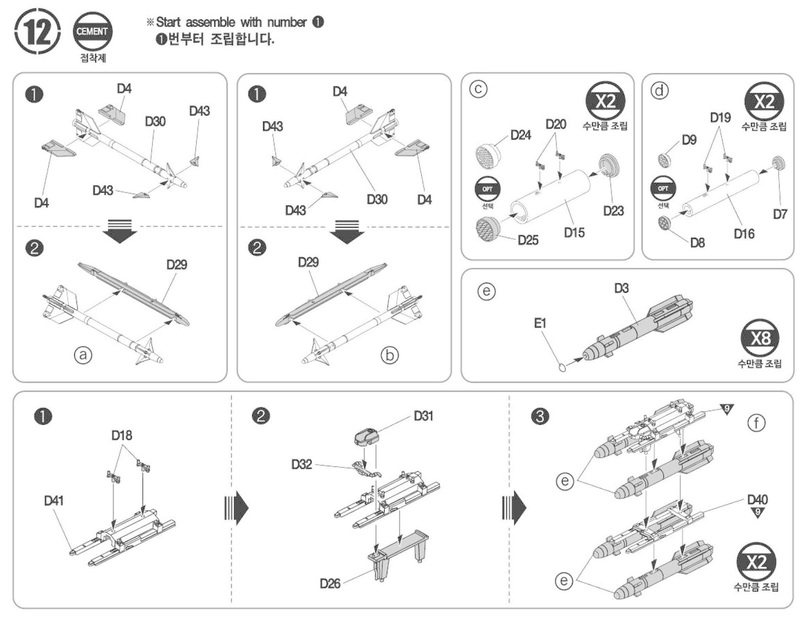 So we can give you more context of the sprues I will start at the Instruction manual. 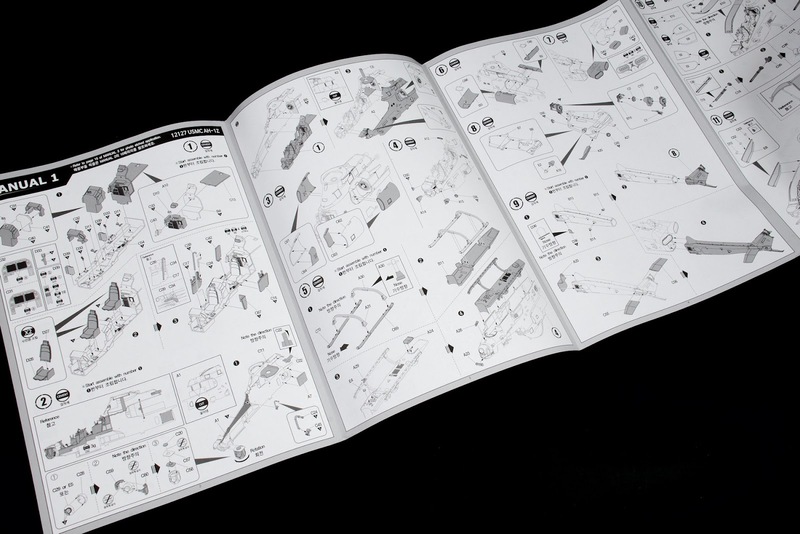 This fold-out four-page double-sided instruction manual is printed on black and white on standard paper. 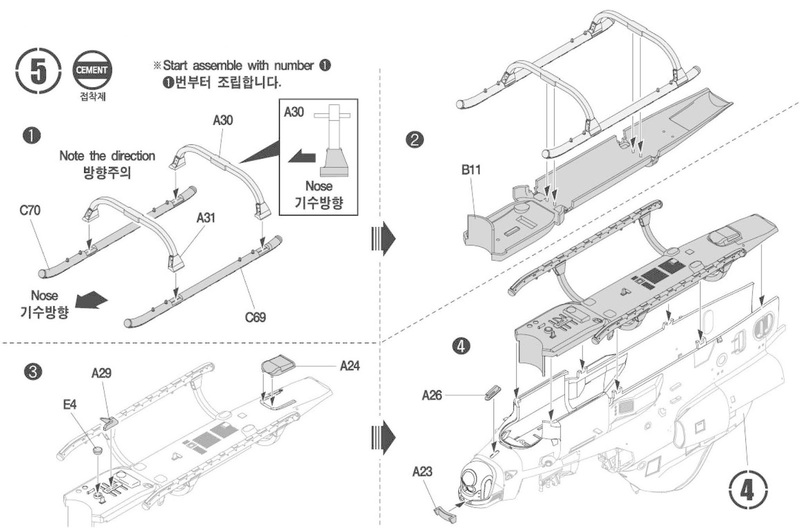 There are seventeen instruction steps in this guide and these steps are sometimes broken up into little smaller sub-builds. 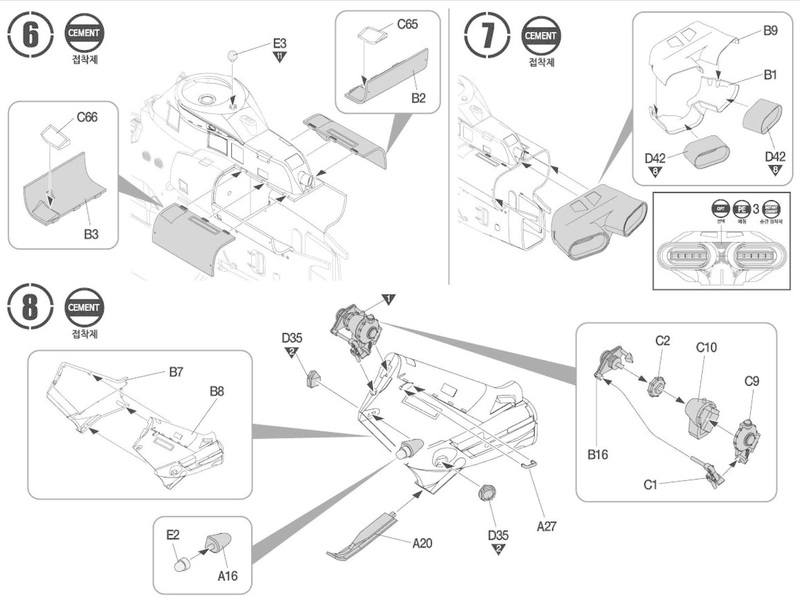 I don't care much for these fold-out instruction manuals, the pages get in the way of each other and you cannot look at just two pages without properly unfurling them and folding the extras away. 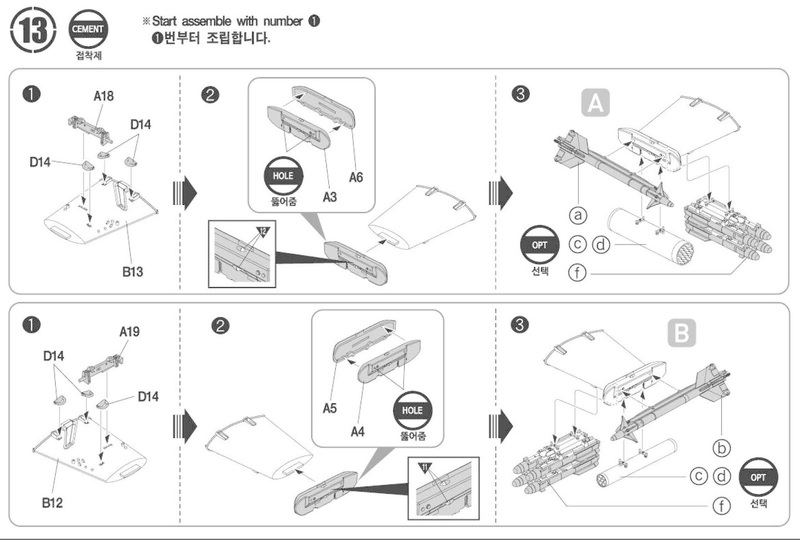 Some might like to look at the whole unfolded half of the assembly at once and although it isn't a big deal I like the booklet style more. 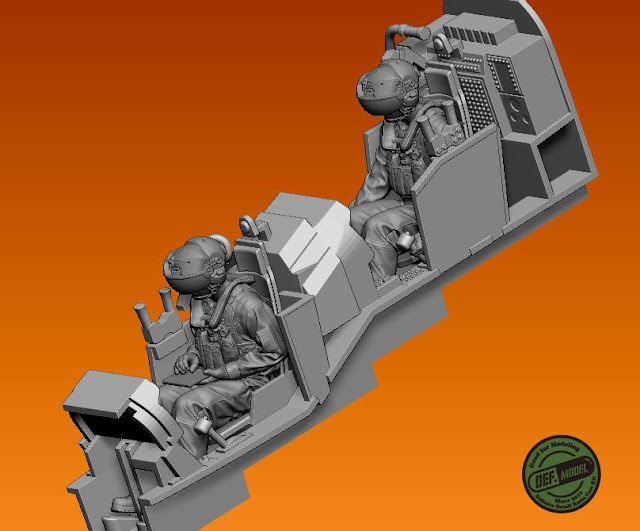 Steps 1-17: Or - "Start assemble with number 1"
Step 1: OK, for a change construction starts in the cockpit, with the two pilot's seats, front cockpit "glass" panel and rear radio/ electronics panel are added to the centre before it is all seated in the cockpit "tub". 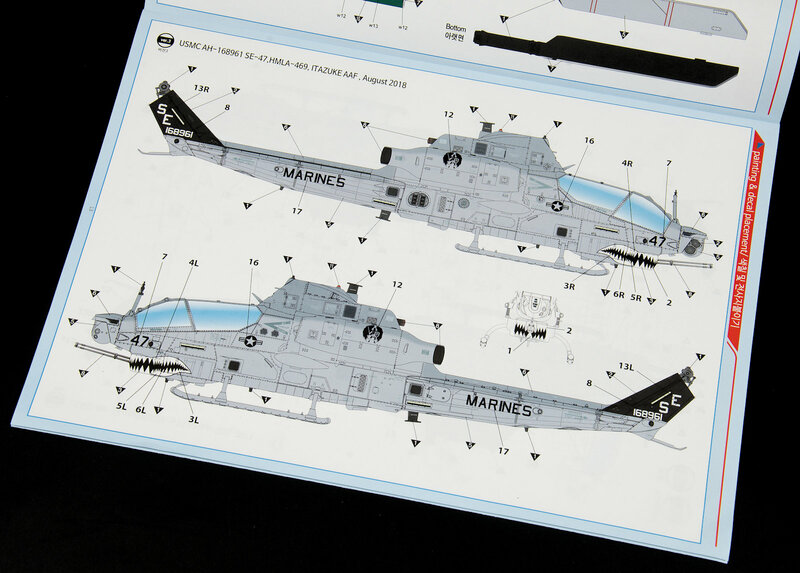 Paint call outs, decal additions and the photo-etch of the kit is notated handily here. Step 2: Most of the inside of the cockpit and the sensors on the nose are from sprues C & D which cuts down on roaming around the sprues. 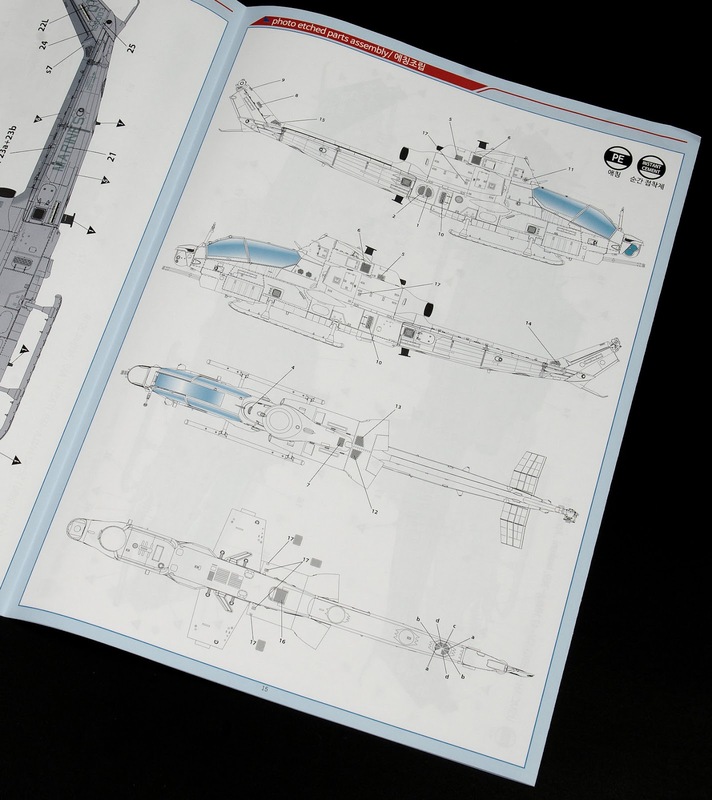 Instructions also point out little boxes with "reference" notated, where important parts of the build are shown in shaded line drawings like this one with the cockpit below. 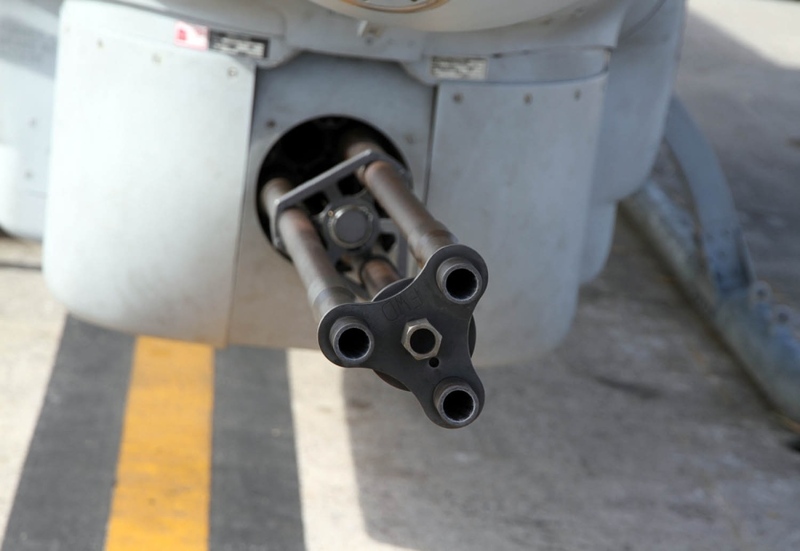 Notice here the Target Sight System (TSS) in the nose can be rotated after installation. In step two we see we need to add three gramms of nose weight at this step (Put in five just to make sure huh!). Steps 3 & 4: We then secure the cockpit tub and all of its assembled parts tot eh side of the fuselage, Engine fan blades are inserted before they seal up, and the intake covers are attached. The other side of the forward fuselage is then added. 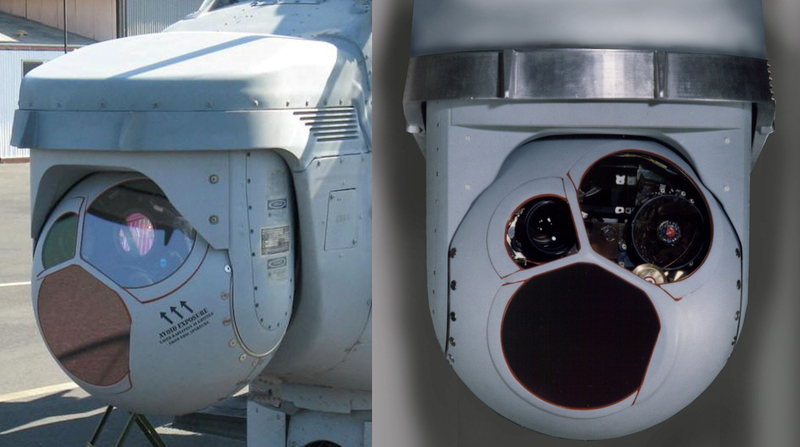 Step #4 sees the simple addition of the AN/AAR-47 Missile Warning System defence sensors on the nose. 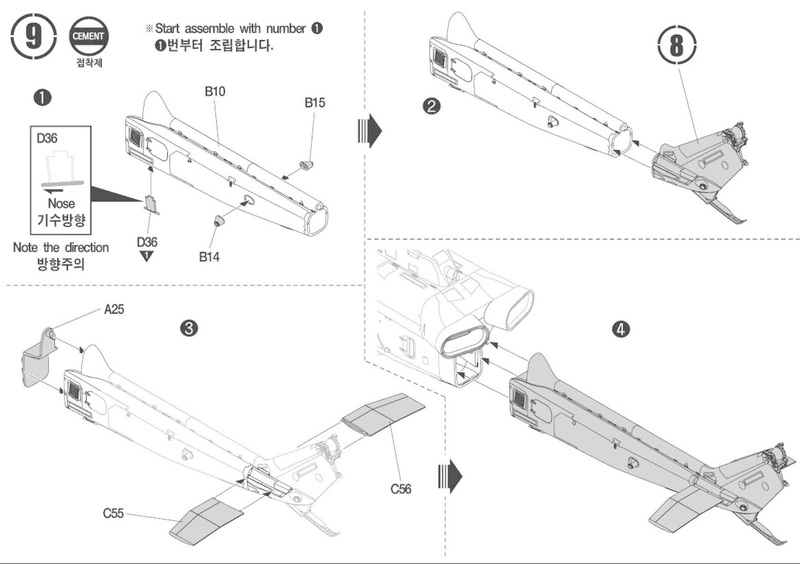 Step 5: Another multi part assembly, with the skids of the helicopter being made, then joined to the underside of the fuselage. 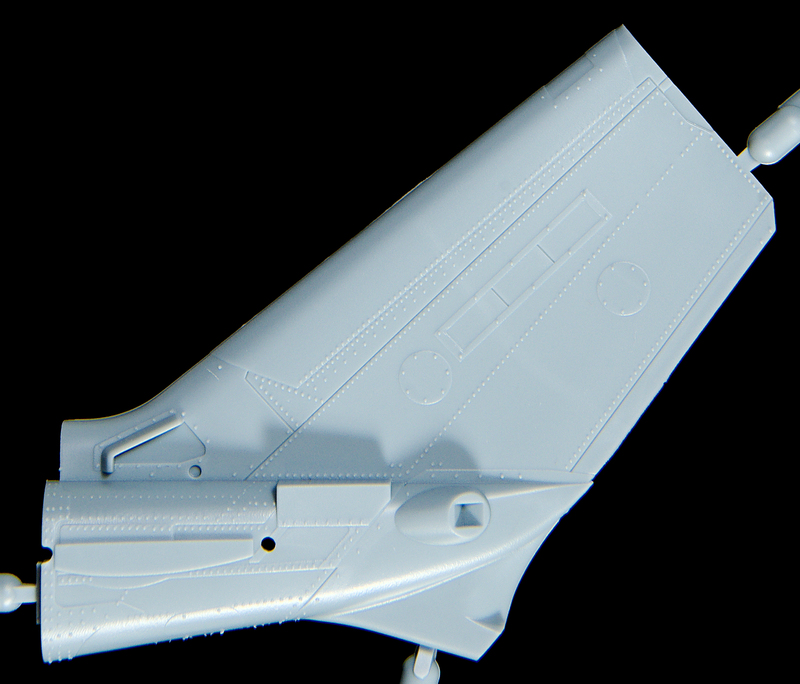 This part is a long, seamless part that joins the model along the natural panel lines of the chopper. 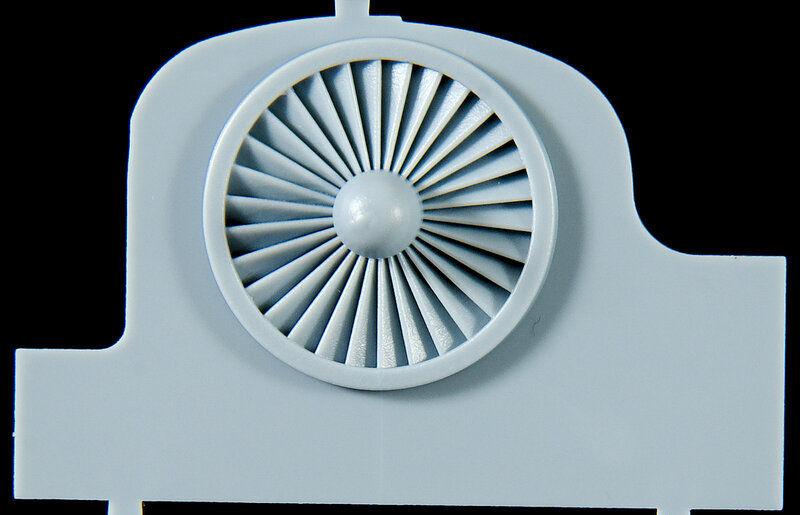 Steps 6,7,8: The engine cover closes up in step six, unfortunately we do not have either of the two General Electric T700-GE-401C turboshaft engines included in the kit so until an aftermarket source is available (maybe from the forthcoming Kittyhawk Blackhawk family of kits?). Step Seven has you putting together the two parts of the exhaust shrouds (B9 + B1) which are sure to have a seam running down them once put together) and the exhaust placed inside them and etch added. 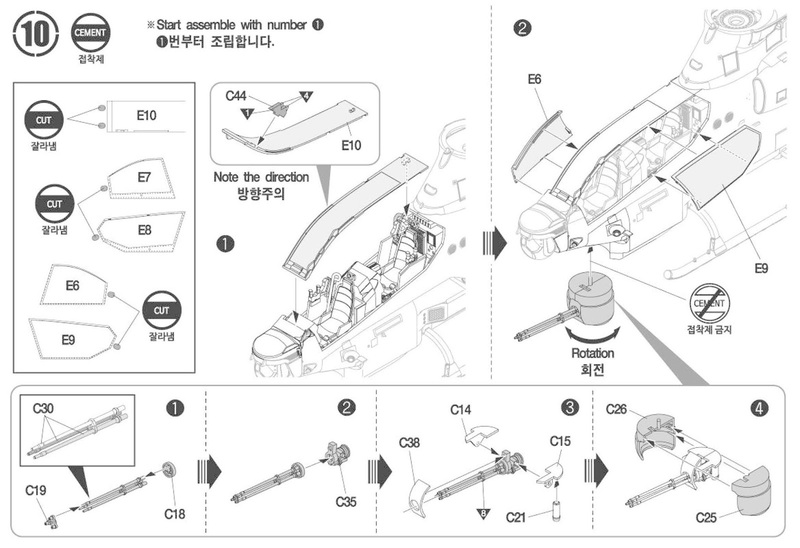 Step eight has us putting both halves of the tail put together and tail rotor axis, tail skid and rearward facing AN/AAR-47 Missile Warning System defence sensors again applied here. Step 9: That very nice one-part piece of the tail boom makes its first appearance now, with sensors, the aerial and the tail we put together in step eight along with the two horizontal tails (which are also moulded as a single part each yeehaa) - lastly the whole rear tail assembly is added to the forward fuselage at this point. 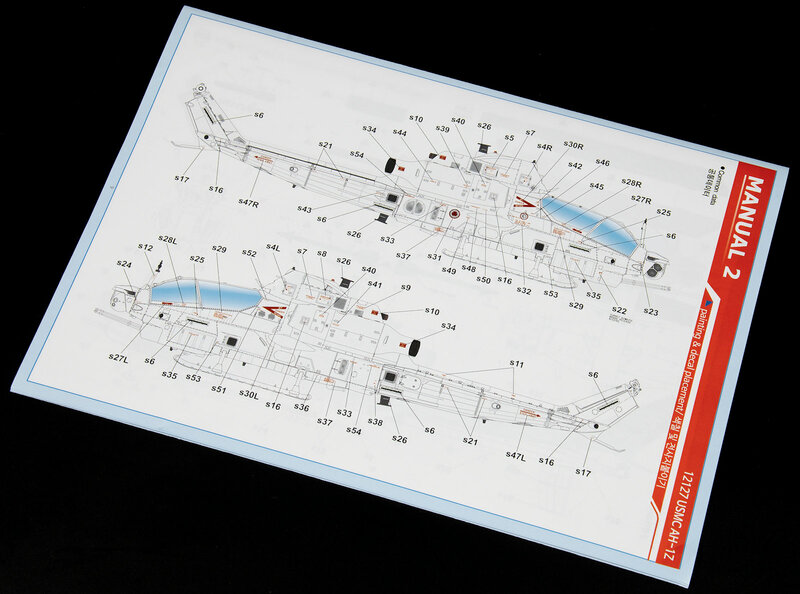 Step 11: If you wish to display the cockpit of your Viper open then step eleven gives you the run-down of just how to do it, the angles of the perspex when it is open and what parts you will need to do it. I suppose if you want to seal it up you just close it all up huh? Step 12: The external weapons are next t o be built, with the 16 x AGM-114 Hellfire missiles complete with their four rails that they sit on. 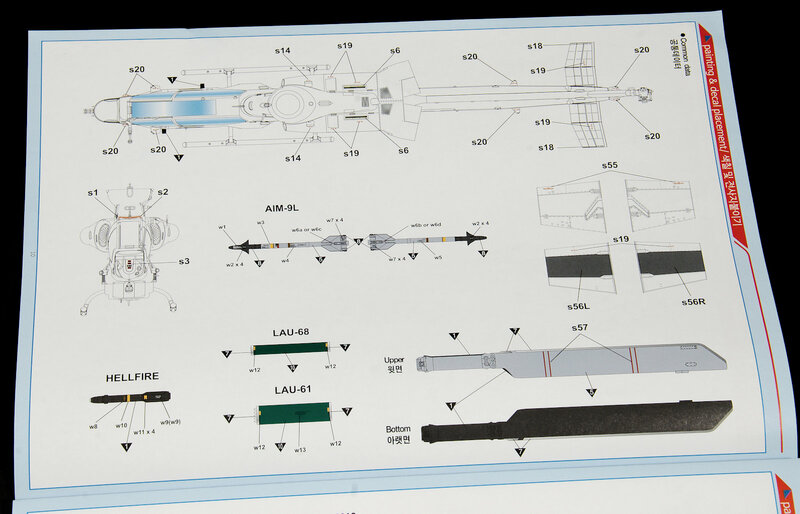 We also put together the four LAU-61 19-tube and LAU-68 7-tube Rocket Pods. 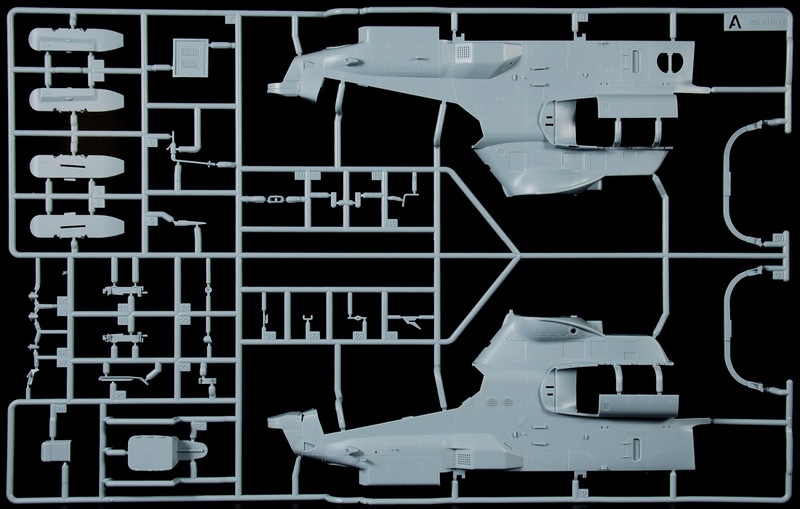 The two AIM-9M Sidewinder missiles and the launch rails are added also. All of these are of course options to be added or not at this point, it is up to you. Step 13: The "wet" stub wings are also in one part - no nasty seams down the centre - and the weaponry and the ECM pods on the wingtips. It is up to you now to add or not include the weapons supplied - or maybe think of something else from the after market - wing mounted fuel tanks maybe? Step 14: Nearing completion step fourteen has us adding the stub wings, a few parts ont he fuselage and the front attitude indicator to the nose. 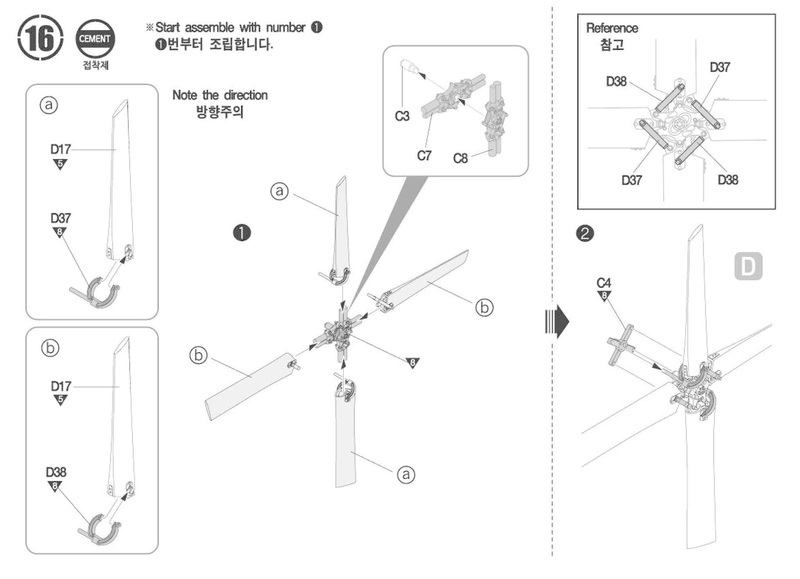 Step 15: Rotor assembly is next, and this main rotor set up is quite easy - The four toots of the rotors are based on a "+" shaped base then the tops added, the swash plate added to the mast and the rotors then being added below the upper faces of the rotor blades, smart thinking Academy. 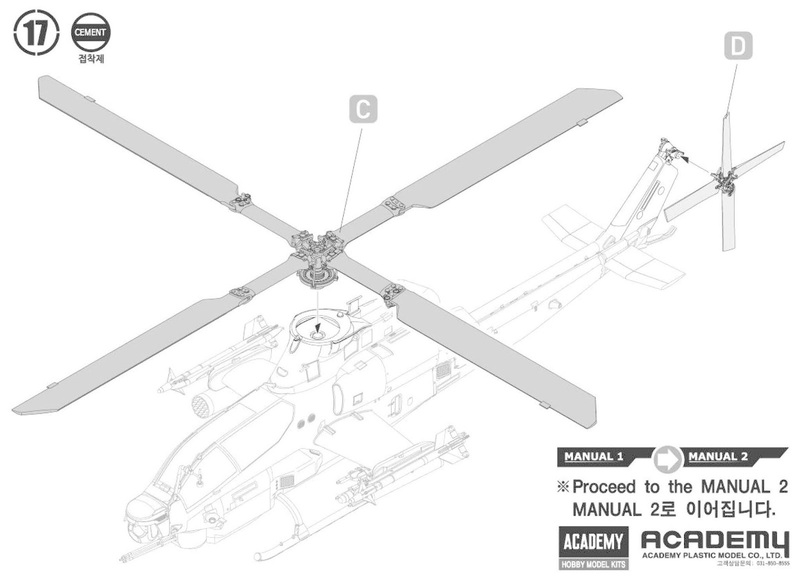 Step 16: Tail rotors are next, and a little like the main rotor assembly they are well engineered, with a "+" shaped guide already set up for you to build the rest of the assembly on. 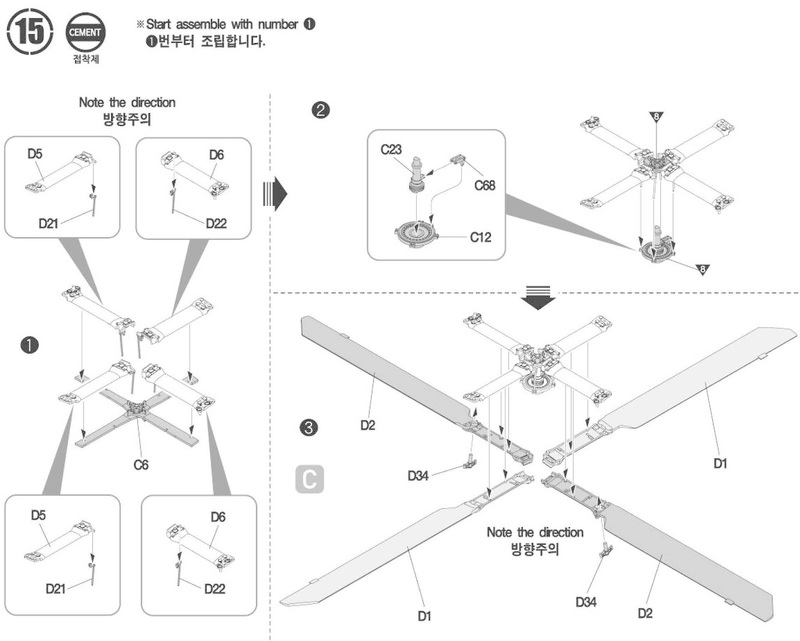 Step 17: Last of all - the rotors can be placed on top of the kit and in the tail. Smart modellers will make these sit in there with a magnet so you can attach or detach for transport if you need too. The instructions then say to move on to part two of the instructions - the painting and marking phases. "Proceed to the manual 2"
The second part of the instructions is printed on coloured smooth but still pretty thin paper, this part of the instructions has on it a sprue map, a guide to the placement of the vinyl masks, a data stencil and photo-etch assembly addition instruction sheet and markings for the four Zulus on it. 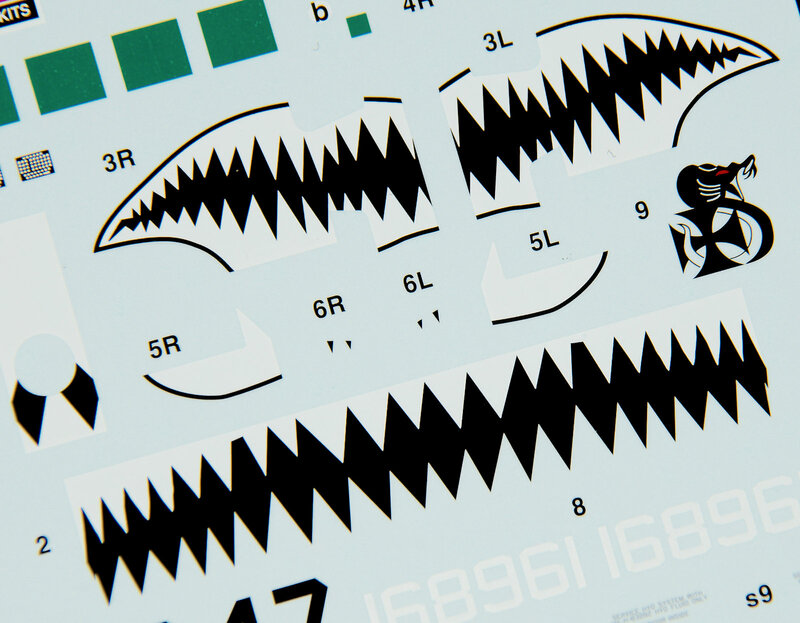 Data stencils and weapons colours are here. 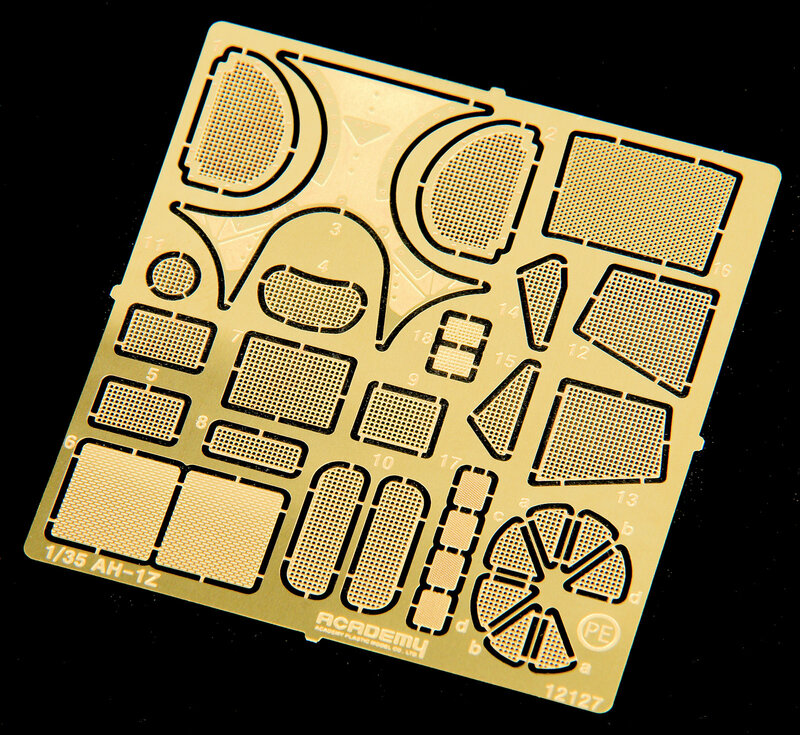 Photo Etch - much of it can be placed after the main parts are built) is here. The four colour profiles from both sides are included. 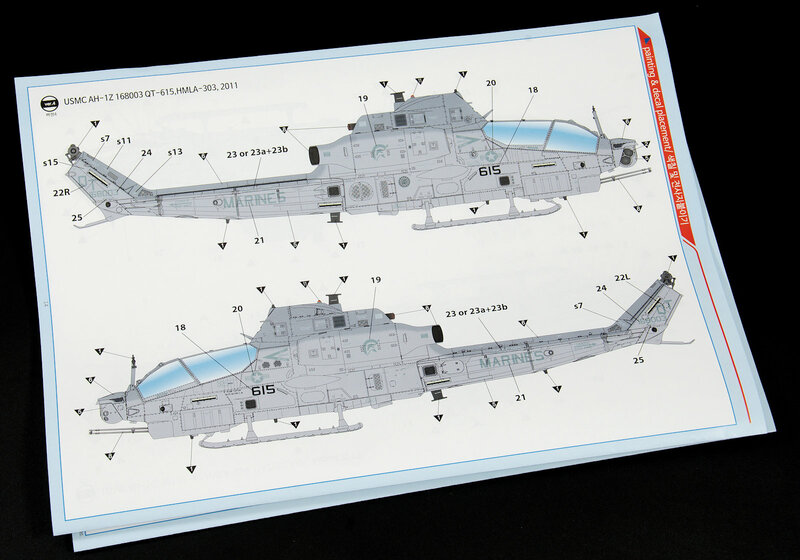 These four pages - and four colour schemes to match are placed in a particularly unorthodox order, instead of seeing all of the aircraft markings on one side of the (again a fold out manual) we see three on one side and one on the other side - Instruction makers - please use your heads dudes! While we already see colours called out on the main instruction manual which again is peculiar, but I suppose people will need to see it while the interior is being painted. 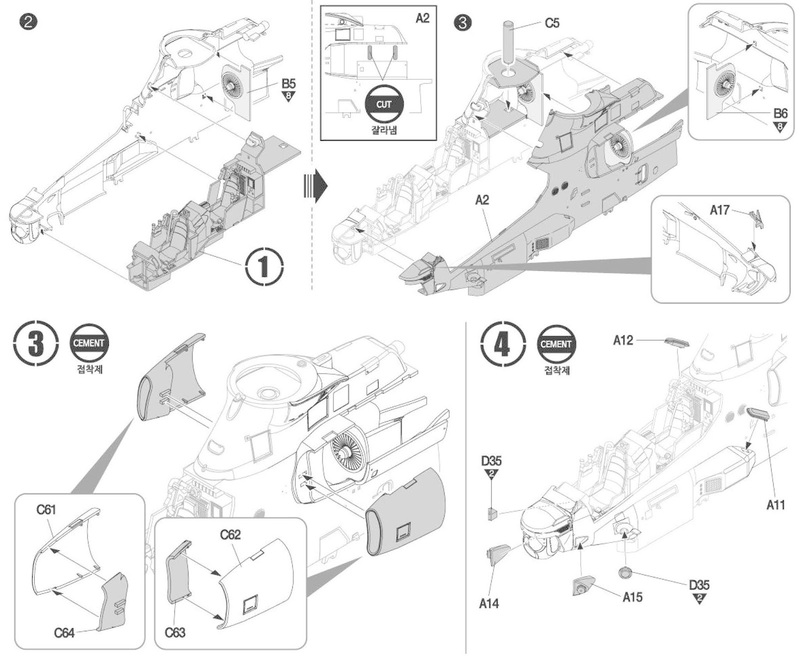 It would be easier for the modeller to have this on the second manual so you can have both open. Colours are called out in Humbrol, GSI Creos, Lifecolor, Testors, Revell, Vallejo and AK Interactive. Light ghost grey, Dark Ghost Grey and Olive Drab are importantly given FS numbers also. 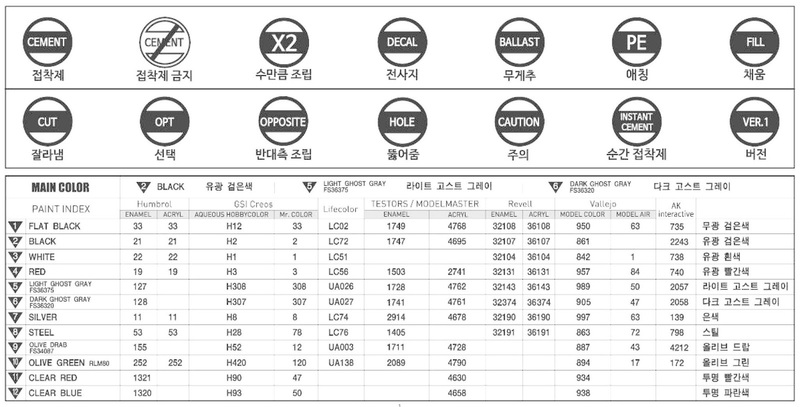 The single decal sheet is provided by Cartograf of Italy. 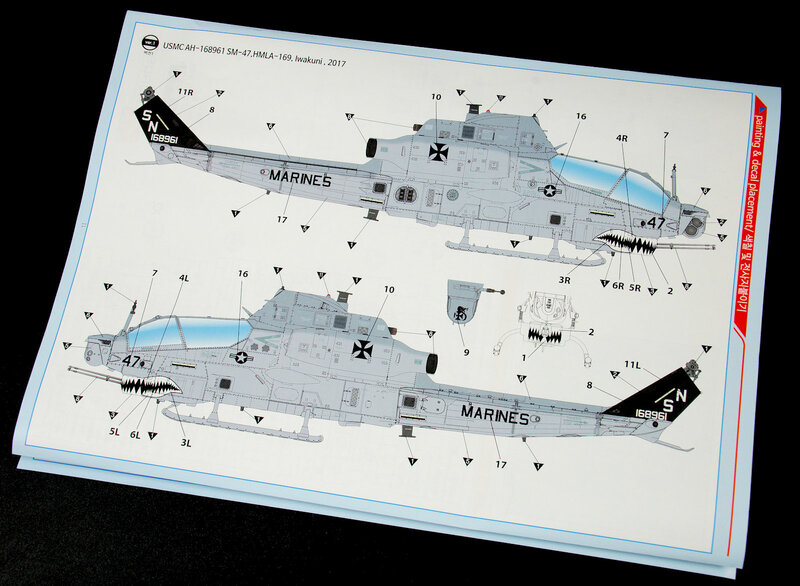 These guys sure know their stuff, and the sheet has nothing out of register, and the colours are all solid with a thick white showing me that the rest of the decals will be fine. The LCD panels for the cockpit are included as green panels. 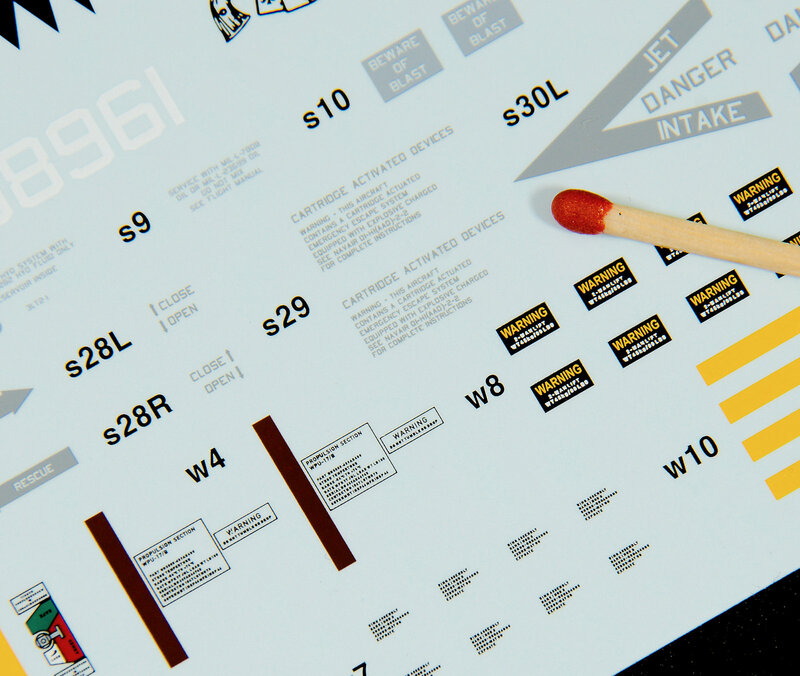 Unit markings are very finely printed - this is great work by the decal printers. 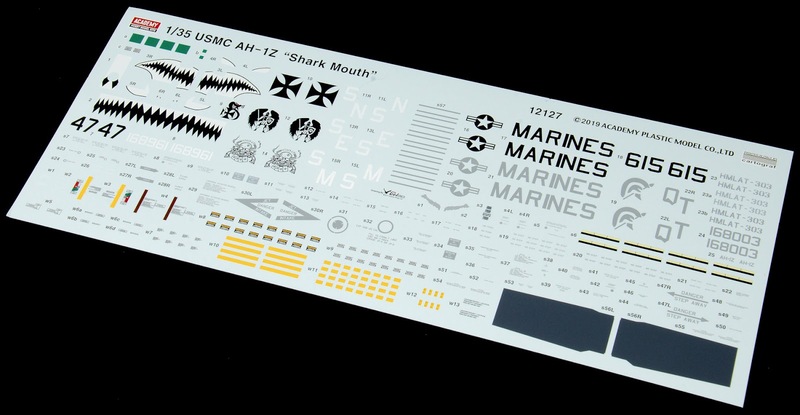 Stencils & Decals have very little carrier film attached to them also. 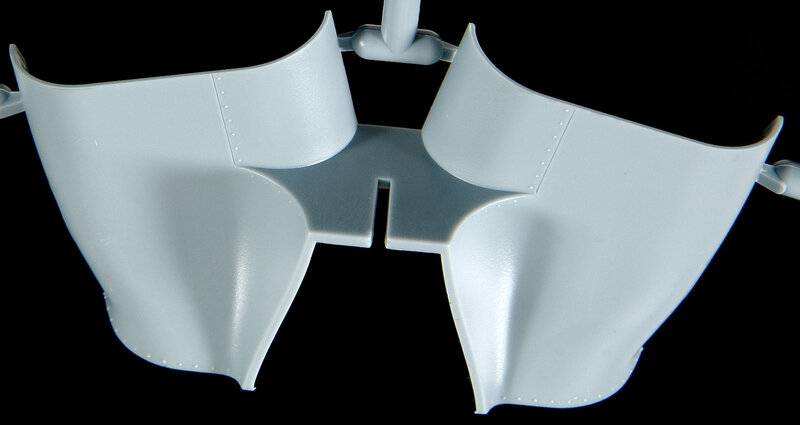 Included thoughtfully in this kit is a Vinyl mask to enable you to simply and easily paint your cockpit canopy. The Vinyl isn't as good as Kabuki in my opinion but ow well something i s better than nothing. It has been peeled back here to show you the frames.. 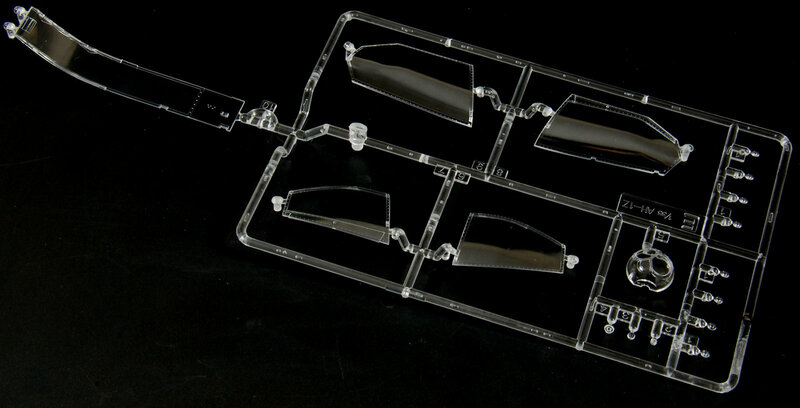 The canopy itself is one sprue fairly clear and transparent so you can see all of the new digitised cockpit inside. There is a slight "wrinkle" in the plastic when it is magnified in these pictures that you may be able to see but only after blowing the pictures up. 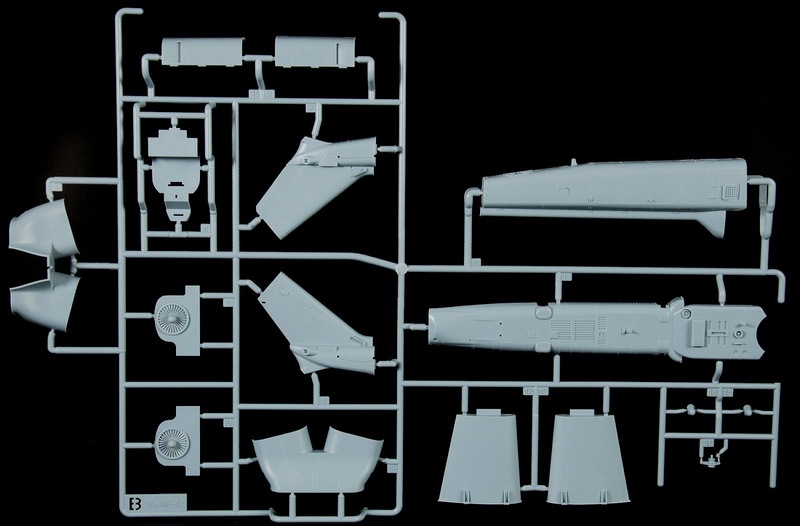 The clear parts for the AN/APR-39A Radar Warning Receiver & AN/AAR-47 Missile Warning System and front Target Sight System (TSS) pod are included in this sprue. You can see the bulged glazing here to good effect and in comparison with the real thing below it. The front windscreen glazing is of a good angle and not distorted in clarity even thought it is bent. The chin mounted Target Sight System (TSS) is pretty much dead on here. I noticed that mins has actually some wrinkled when magnified as much as I have in this picture. The shape of this alternative part is however correct. 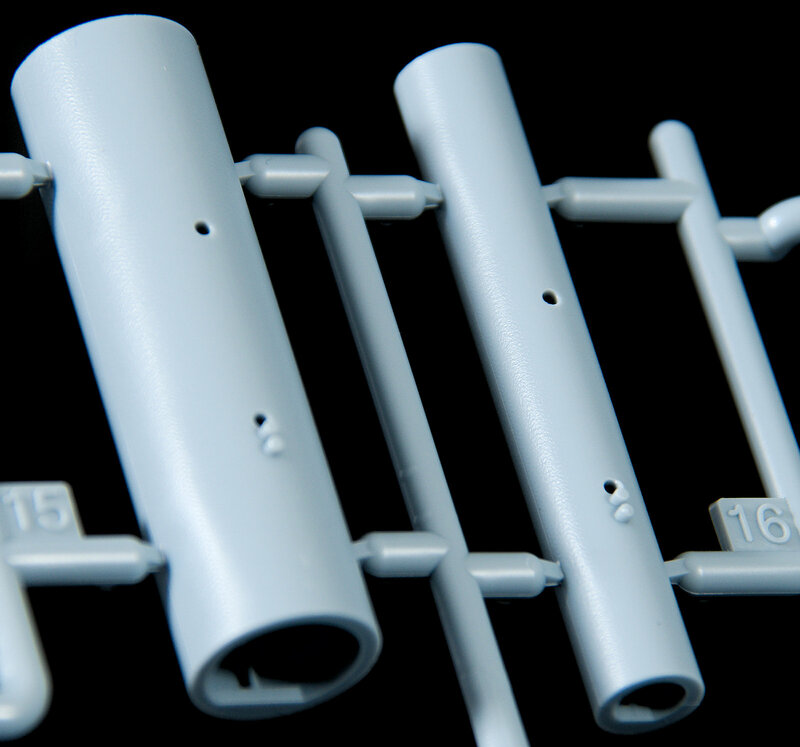 This part is an alternate that can be used to the grey part int he kit that has decals added to it - your choice. 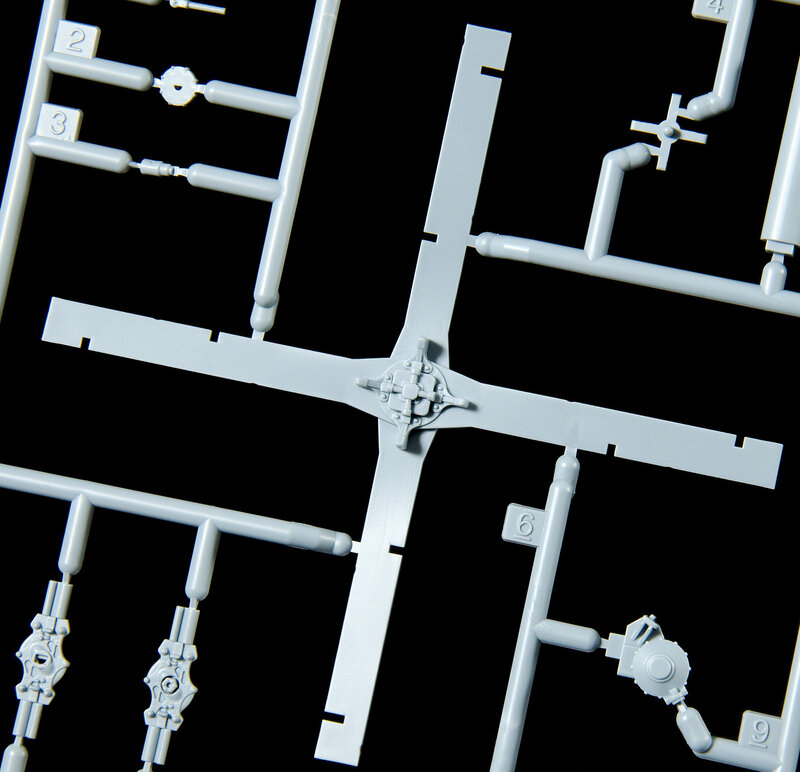 Five sprues in this light grey/ duck egg blue colour are included in the kit also. Most of the sprues are sealed in their own bag, and I did not see any damage on the sprues bundled together. 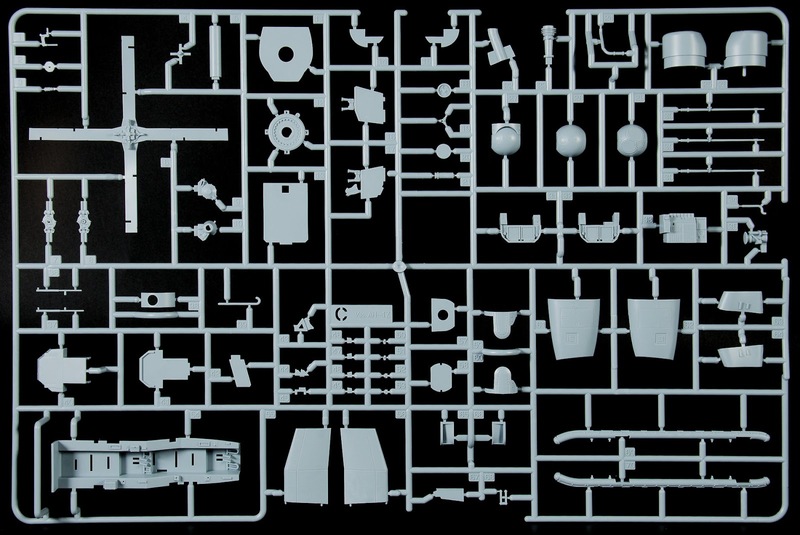 The nature of the surface detail of the kit will be of some great interest to many modellers, as there is not only recessed panel lines and rivets, but also raised rivets (yeah raised rivets you remember them). 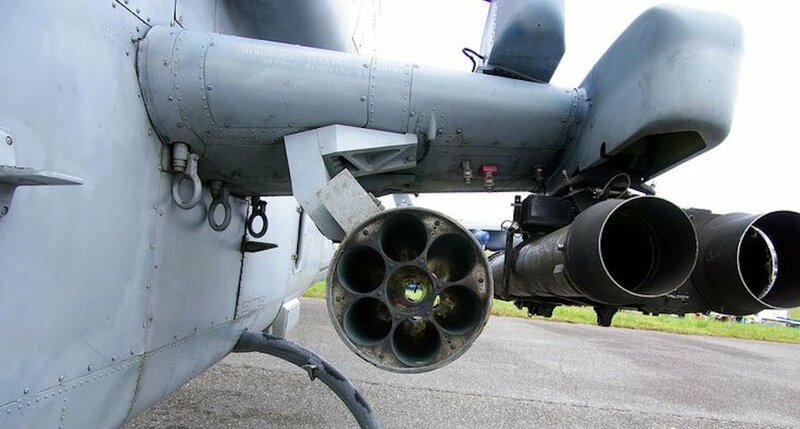 This is correct for this and many other helicopters and definitely noticeable when you are looking so close at this helicopter. 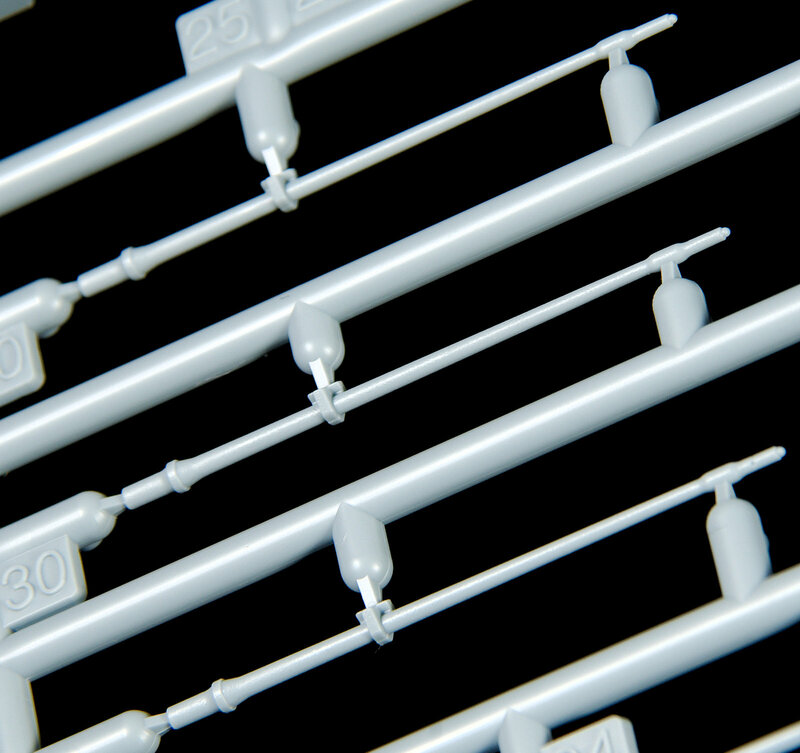 There are also a lack of ejector pins in any placed they might be seen and little flash on the sprues - very healthy looking plastic so far, let's look at each sprue and compare them to the real thing. 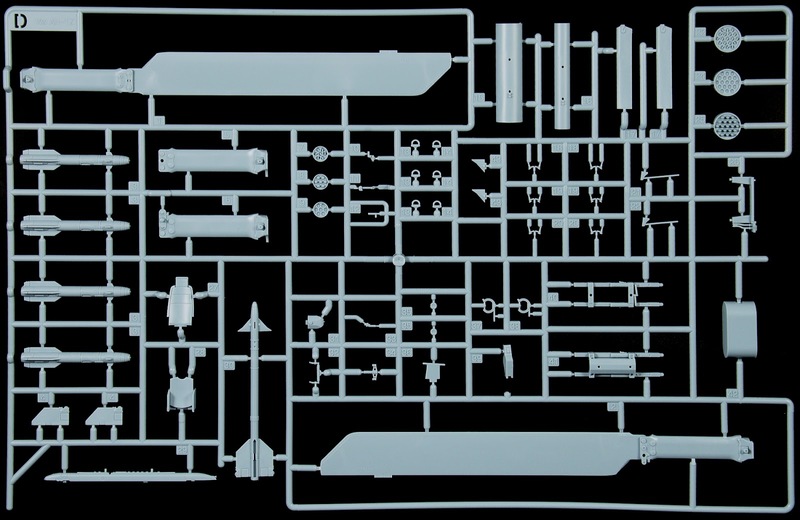 Sprue A: Sprue A is the largest on the sheet, and it features the two largest parts in the forward fuselage of both part and starboard sides of the "Zulu". 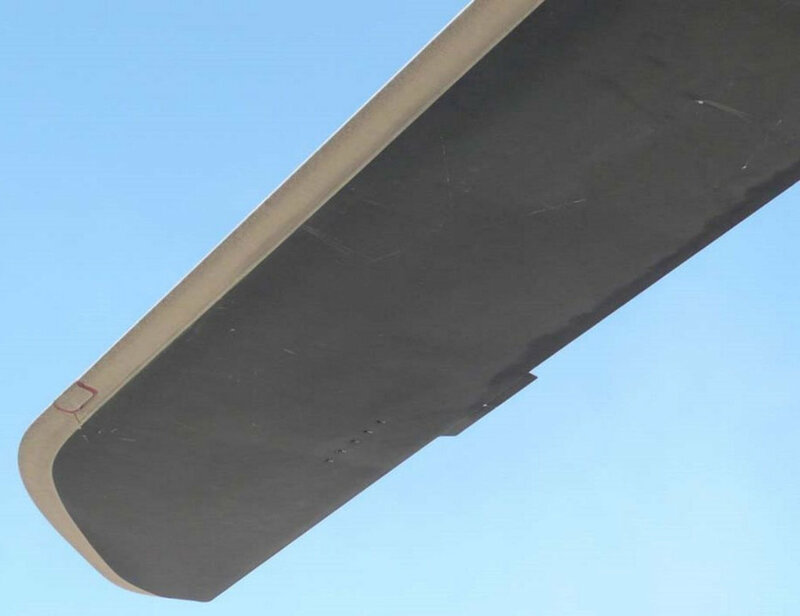 Also are included here is the landing skid brackets, the wingtip pod fairings for the stub wing and a lot of the fins and aerials that bulge off the fuselage are here. 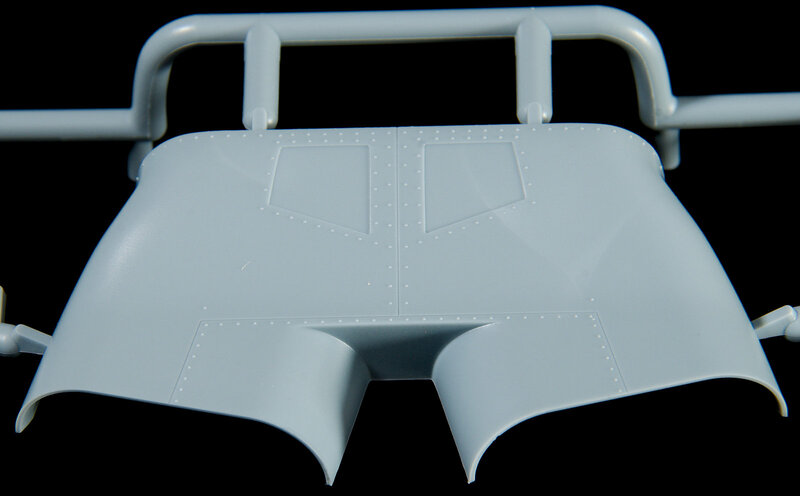 The whole of the front section of the cockpit right up to the til section is include on this sprue in port and starboard halves. Notice the rivets raised and the panel recessed lines as they should be. Detail of the fuselage is here a little obscured by the wingtip pylons but a good comparison to the real thing. The struts for the landing skids are here moulded as one part which will help in their strength after I pack that whole three grams of nose weight in there! Although the skids are on another sprue seeing we have some many pictures of them here I thought it would be good for comparison. You MAY want to trim down the tie-down loops if you want but wait until the end of the build to try for such fine detail. 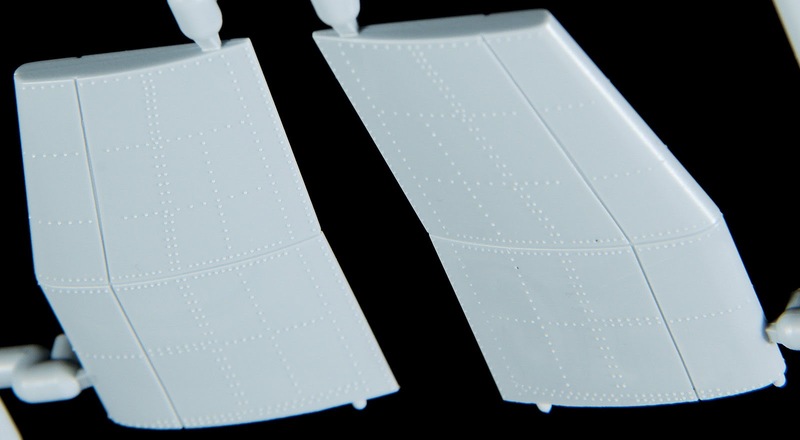 The wingtip pod fairings for the stub wing (I wish I knew their exact name) are provided on this sprue also, and the detail on them is fairly close to the original details in the pictures below. 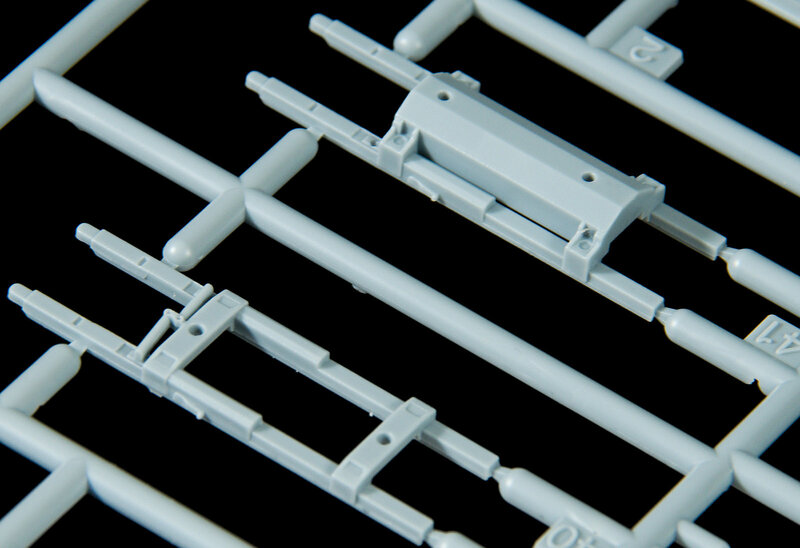 Sprue B: We go from the front to the back now with an interesting sprue that will save modellers some time. 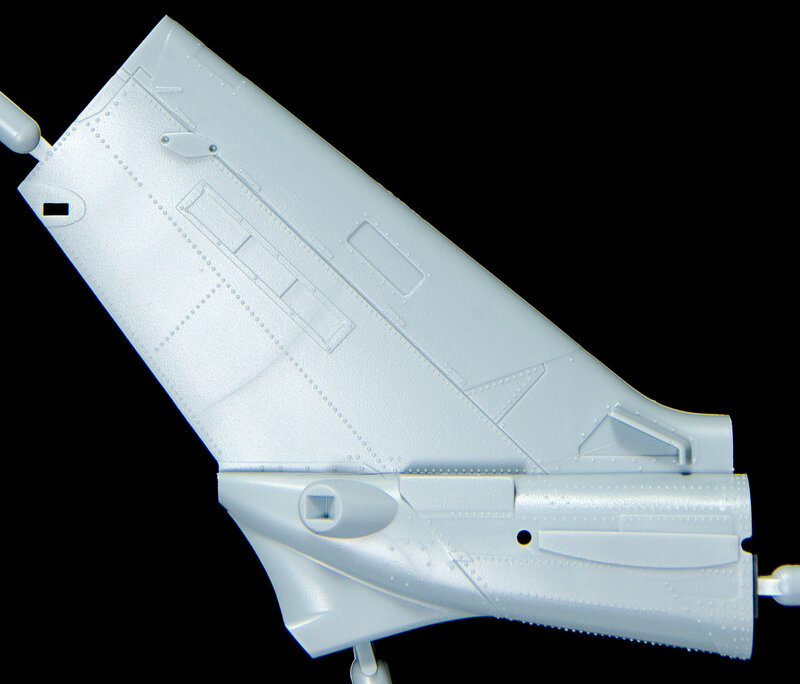 The tail section is featured in most of the parts here, with the one piece tail boom, the stub wings of the fuselage, the internal fan blades and engine exhaust shrouds, the engine covers, two tail halves and lastly the belly panels of the "Zulu" all here on this second sprue. The stub wings on the Viper double up as not only weapons pylons, but as "wet" wings with small internal fuel tanks that extend the helicopter's range. The thickness of the wing and raised rivet detail on them look just about right to me. Both the top and the bottom of the exhaust shrouds of the two engines are here, joined horizontally, I am sure there will be some sanding and filling here to be done don't you think? The photo-etch from the kit is added on the top of the engine shrouds and the flat space between them masking most of the seam created by them joining horizontally. The impressive one part tail boom had me at "hello" - no nasty seam to remove in amongst all of those raised rivets, if there was a part of this model I like the best it is this, smart engineering and accuracy in the part - can't ask for much better than that! The belly of the aircraft is not often seen, but here the one piece belly is moulded so there are as little seams to clean up once again. 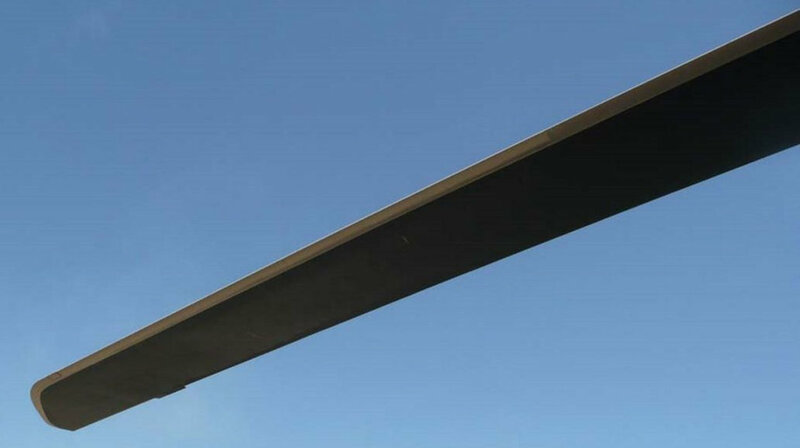 The long piece travels right along the fuselage and horizontally along the bottom of the fuselage allowing you to add the whole bottom as late as you wish. 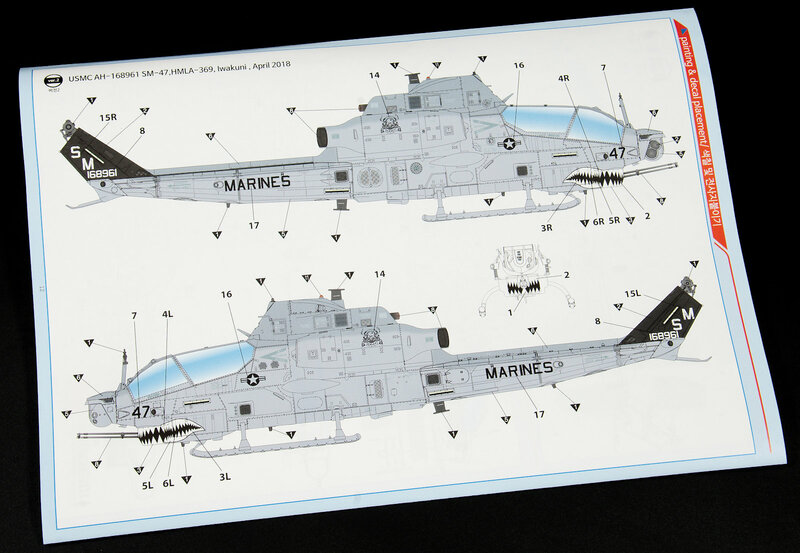 The picture comparison here below shows the same panel on the real Viper and how the kit part is smartly made into one part. The tail section is finely moulded into something, that with a few wires around the gears and hub will make a very nice replica of the real thing. The raised rivets and recessed panels again here are nicely done and a good stand-in for the 1/1 scale item. The reverse side again here, the two blanked out inspection panels are in the right positions, as are the navigation light strips and skid base. Impressive to this modeller's eyes. This thirty-two blade turbofan is a thing of fiction. as there are thirty blades here to the real thing's twelve blades. 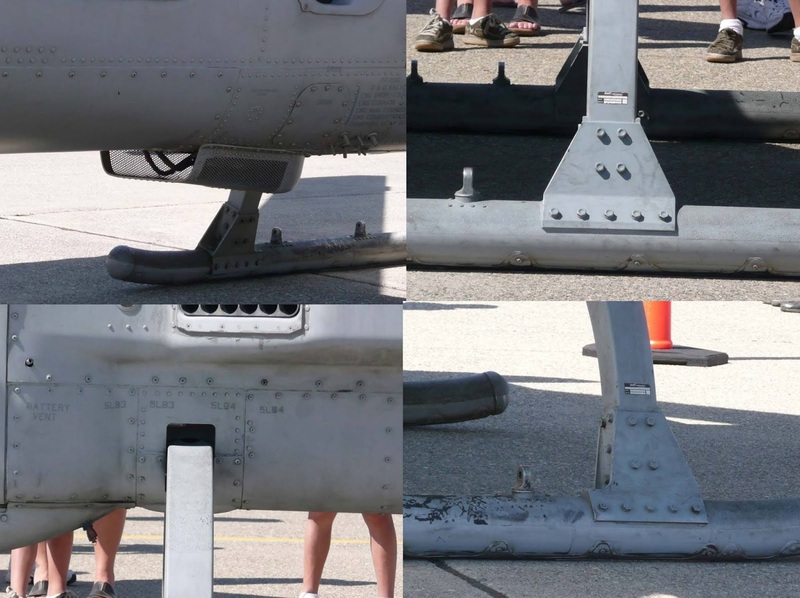 Not a real problem as these are almost all hidden inside the narrow AH-1Z's intakes. 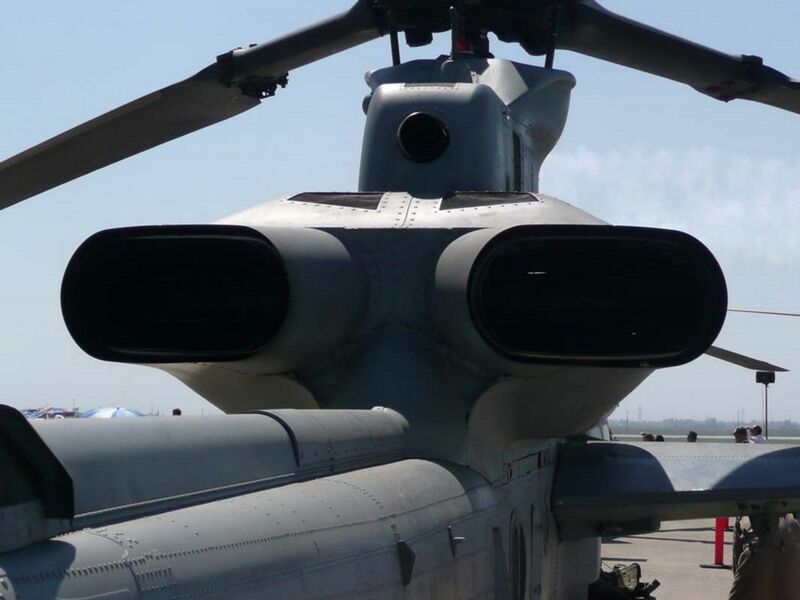 The real T700 engine was designed for the US Army’s UH-60A Black Hawk helicopter as a result of lessons learned in Vietnam. The key requirements of this engine were reliability, operation under adverse environmental conditions and low maintainability. 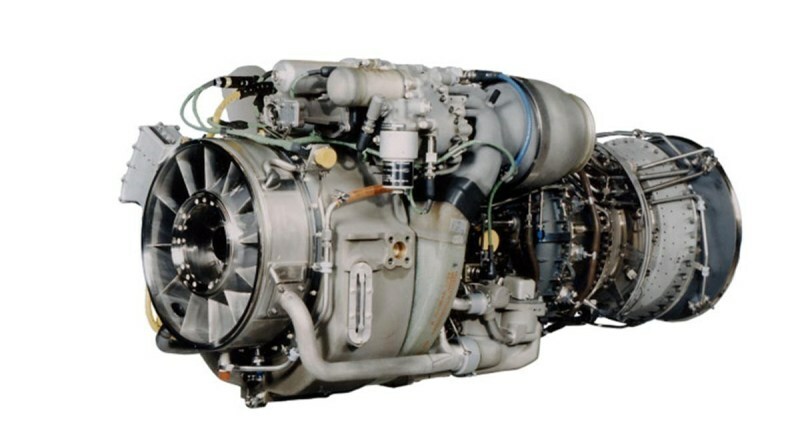 The T700-GE-401 engine was the first engine qualified, under US Navy’s rigorous salt ingestion tests, suitable for shipboard operations. 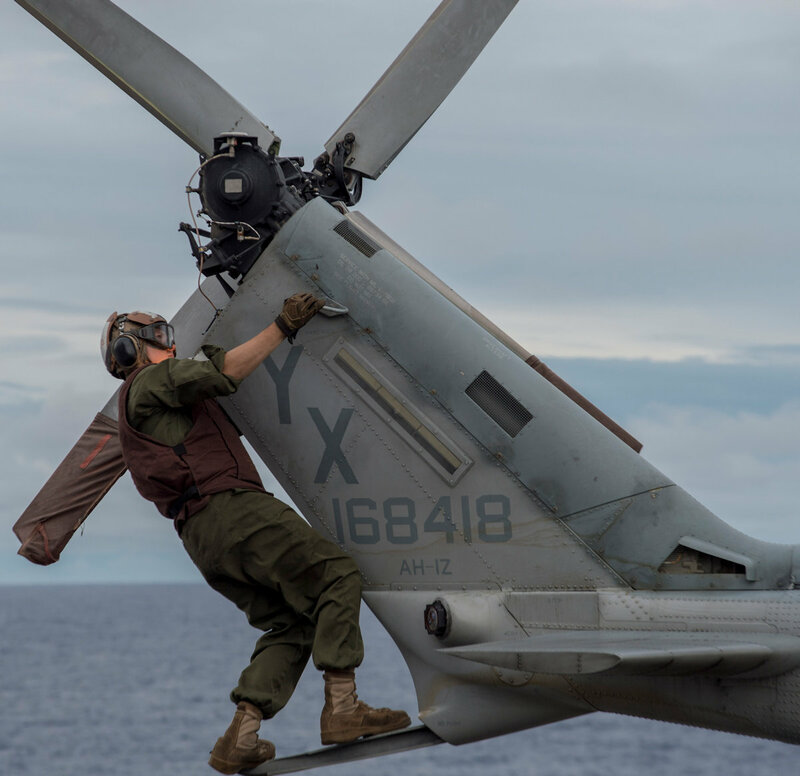 This engine was selected to power AH-1Z/W and UH-1Y among other naval helicopters. The axis of the four-bladed main rotor is here, the rest of the structure being built around that. 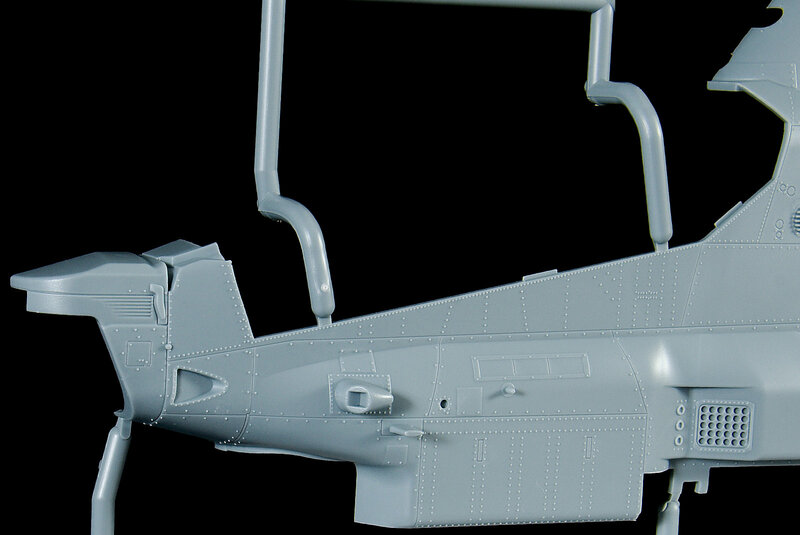 The rotating pod for Lockheed Martin's AN/AAQ-30 TSS Hawkeye EO/IR fire control system – Target Sight System (TSS) is here in the second incarnation in this kit in solid grey rather than the clear version that we have seen on Sprue E. This one is simply painted up and the decal is used instead of leaving the insides clear. I think maybe a better solution until some "innards" can be made for this pod. The real thing in comparison. 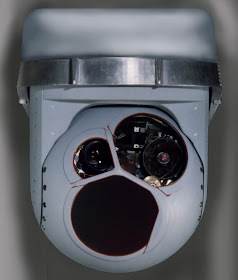 A little bit of detail inside the sensor dome is missing here don't you think? Each crew station has two 8×6-inch multi-function liquid crystal displays (LCD) and one 4.2×4.2-inch dual function LCD display. The communications suite combines a US Navy RT-1824 integrated radio, UHF/VHF, COMSEC and modem in a single unit. The navigation suite includes an embedded GPS inertial navigation system (EGI) and a digital map system. These two displays are almost the same, and in the kit this is also true. 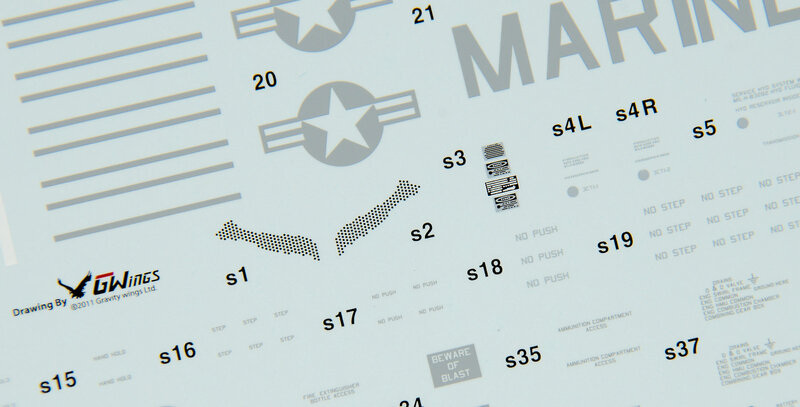 The screens are represented as "off" with simple green screens on the decal sheet. The switches and buttons are very similar to the picture of the real thing below. The cockpit tub is pretty standard fare but it all of the parts that can be attached that really doll this up. Little aftermarket apart from some wiring will be needed to make this pit fill up. 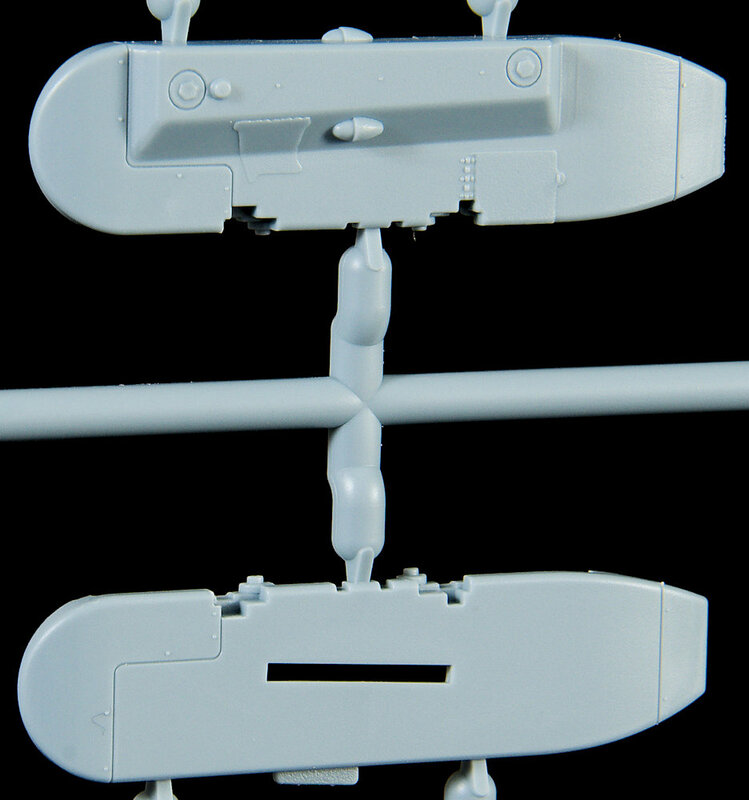 The twin horizontal tails with a flat top have the raised rivets and single panel line in them - a little deep for my liking but this can always be filled just a little. Most people will not even notice. 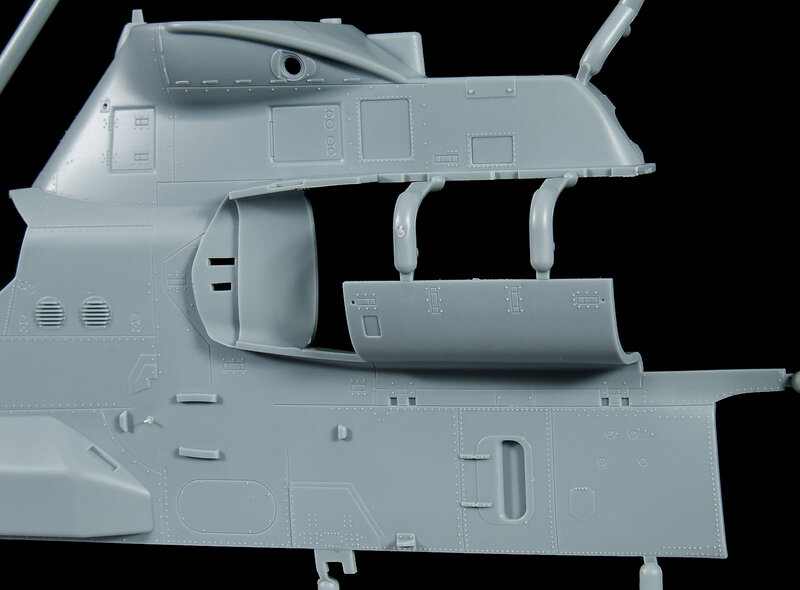 Sprue D (X2): The first and last double sprue, with the main rotor blades here and the external armament and it's pylons that they attach to, the pilot's seat and a few other parts are here. 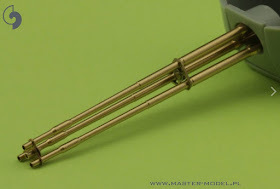 The main rotor blades of the "Zulu" are each in two parts, and these slide over the "+" shaped stem on the other sprue. 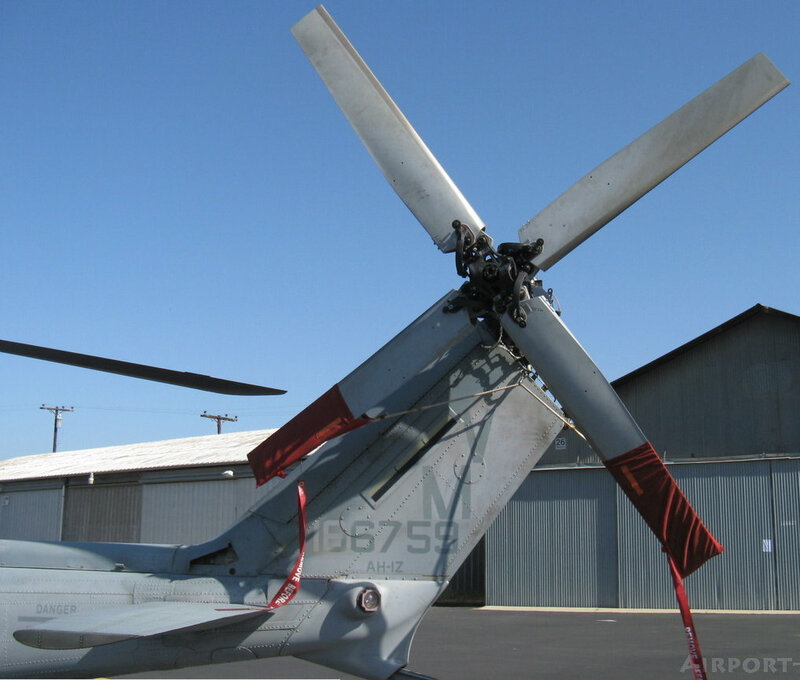 I Like the shape of these, and the thinness of the rotor's trailing edges is really impressive. A great replica of the real thing. 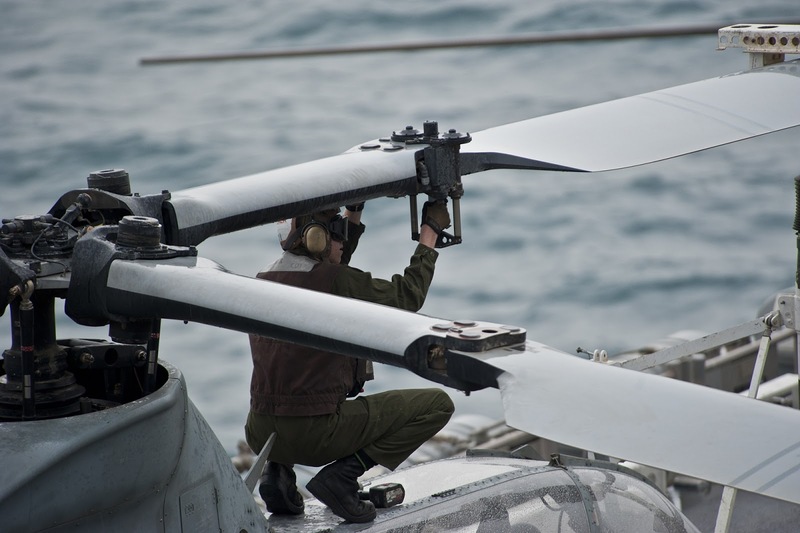 The four composite main rotor blades are made from fibreglass and epoxy and unfortunately, there is no option in this kit for them to be presented in the stowed position. Still, that would be a more expensive kit. 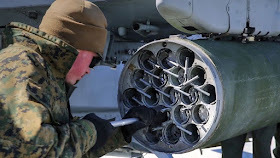 As for weapons pods, we have four of them, LAU-61 nineteen tube Rocket Pods for 2.75″ (70mm) Hydra-70 rockets and the LAU-68 seven shot for 2.75-inch rockets. 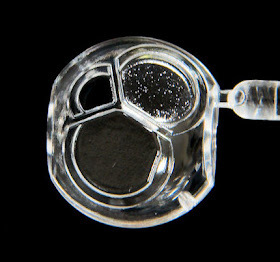 These are shown either loaded or empty, although the empty rocket tubes are not hollow, the front holes are however deep enough to be painted into looking like they are hollow if posed empty. A similar story with the smaller seven shot LAU-68 - nice enough for display but not if you want to see hollow tubes. 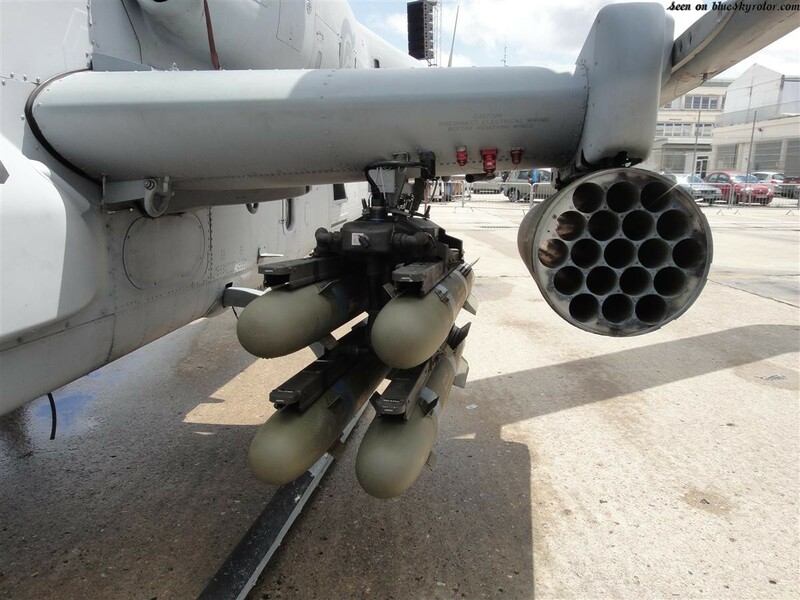 Included are eight in total AGM-114 Hellfire missiles in 4x M272 four-round missile launchers. these are pretty heavily detailed - a little too much for me, and I would look for replacements or leave these off. 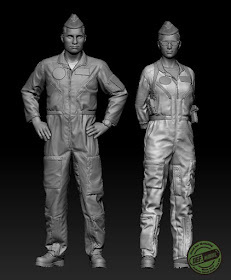 Eduard makes some great Hellfires - but not in 1/35th scale (yet). The two-part seats are pretty bare, and no foam texture is really on display. There are no harnesses included for either crewman crew-person which is the only real roadblock to building this kit completely "low-tech" out of the box. The exhausts are here moulded with some care, they do look pretty close to the real things also so I am impressed - people will look inside here at some point so I am glad these are better than the fan-blades in accuracy. 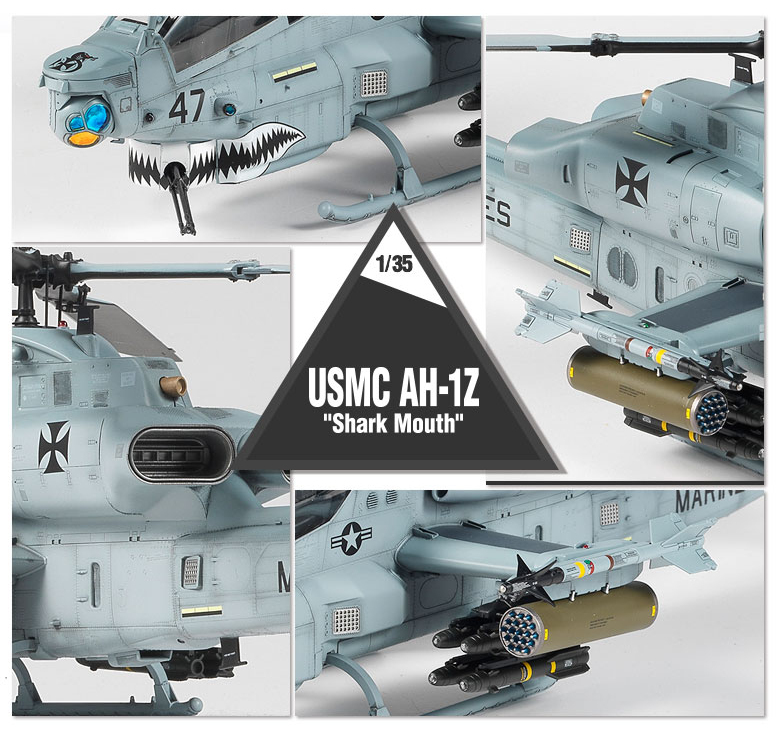 OK - so that is all there is in the box of Academy's new tooled 1/35 USMC AH-1Z “Shark Mouth” kit. What do we think? I found this kit at Hobby-easy at pre-order for just under $40USD, so for such a base kit that will need extra added to it this is the price point that it will be worth the money - not 50 -60 bucks US as it is currently going for on Ebay - so wait for this price-point and I would be happier with the kit for that. 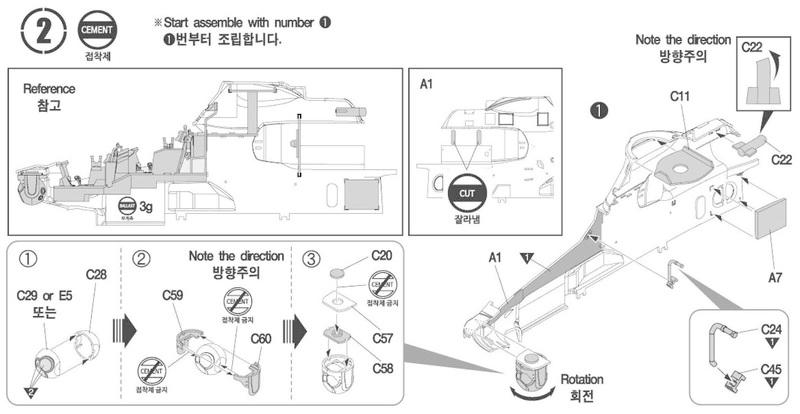 Well, it is a basic kit, there are no crew harnesses, no internal avionics bays and no rotor folding mechanisms. The decals are pretty nice but they are limited to two schemes with some slight changes to flesh them out to four (pretty cynical move actually - Werner's Wings will surely make some alternates). The nose gun is pretty mediocre (Master Model & DEF Model make great replacements) and the Hellfire even less desirable. 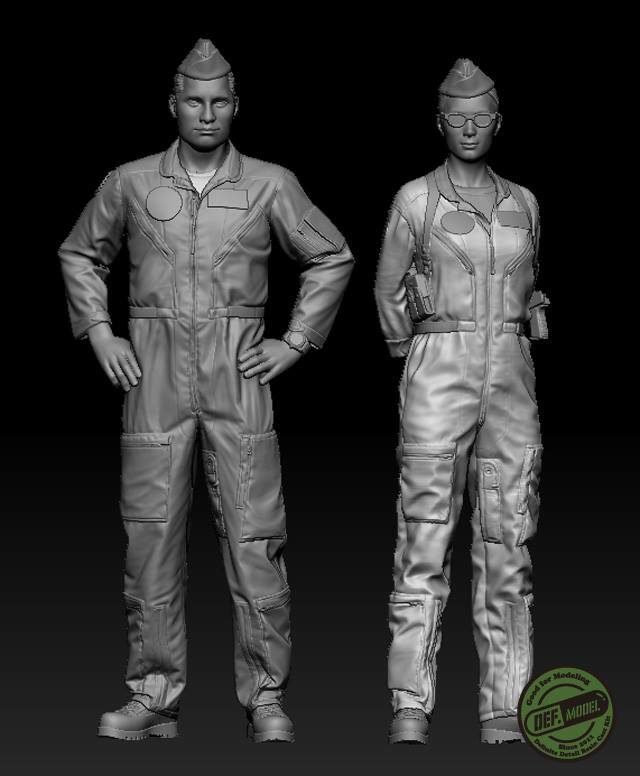 No crew included in the kit (although DEF Model are fixing this). If you want to wait for aftermarket to come to the party or scratch build some of your own details this accurate but rather vanilla kit can be made into something very nice without much trouble even for beginner or intermediate modeller. By itself this model is enough for 80% of the modelling public, but some people want just that little more than this kit provides and that is fine. 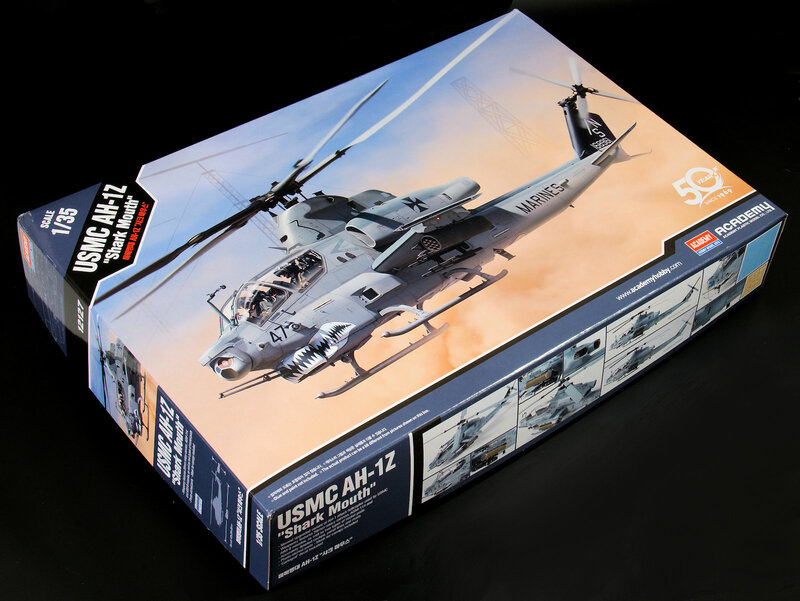 The better modellers will use this kit as a great base to make a show stopper. 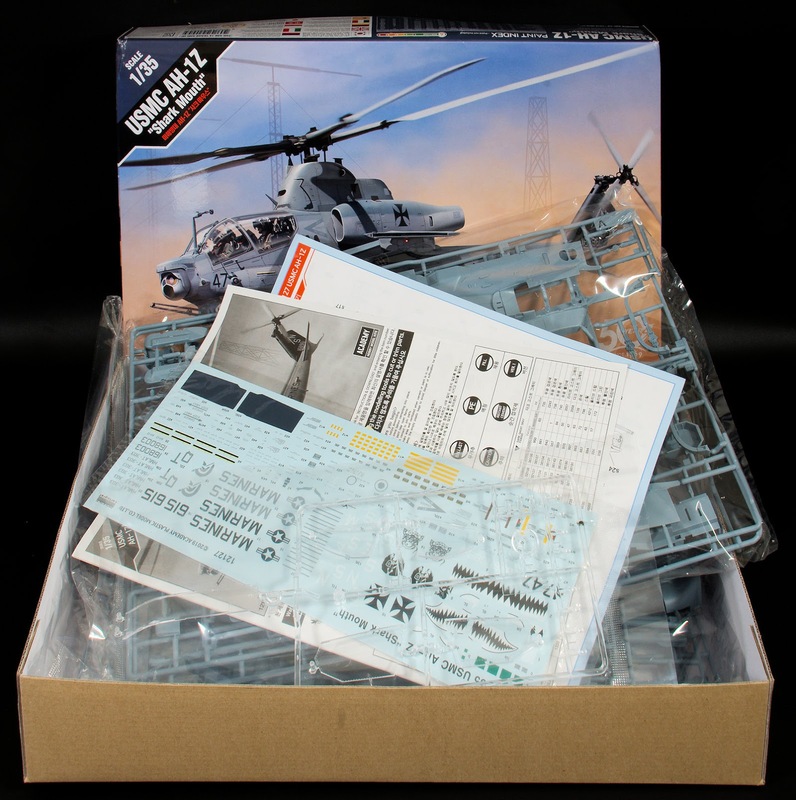 This kit is now available from HobbyEasy on pre-order for a very cheap USD$ 38.29! !